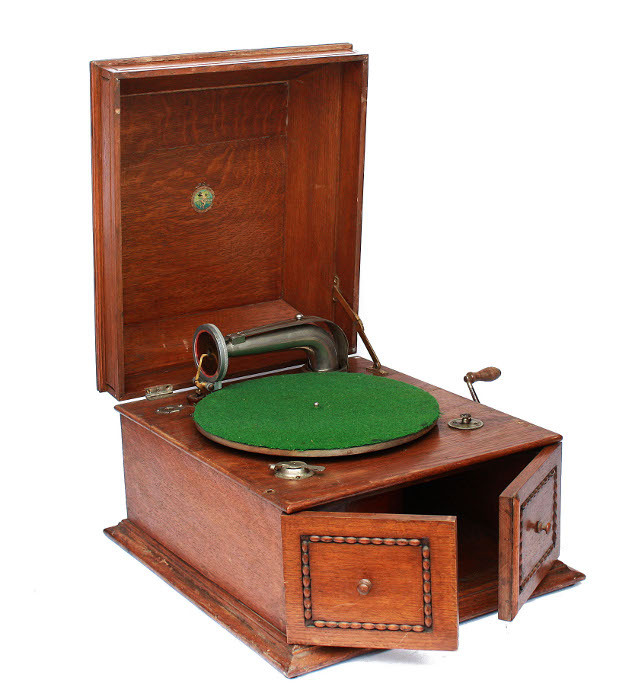 Compact table grand, the '12 guinea model' introduced in 1921. 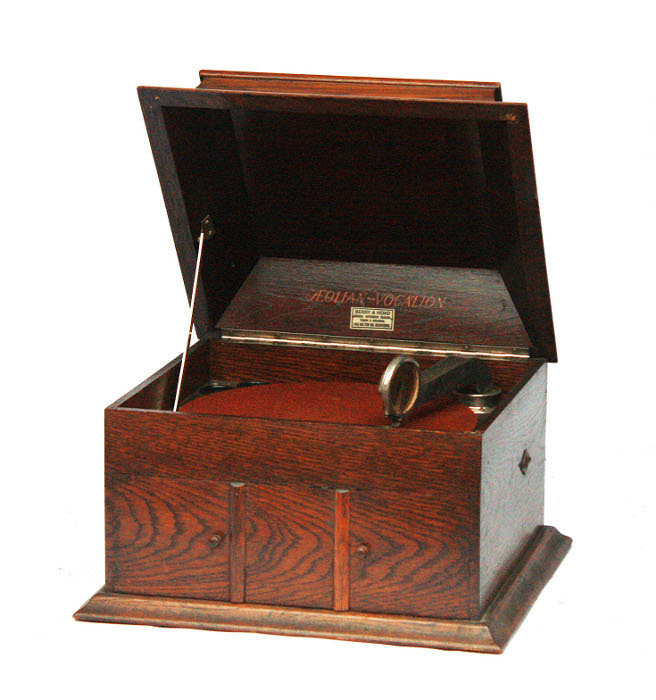 Square oak case, rotatable AV soundbox on square section tone-arm, doors open inwards to form horn bell. 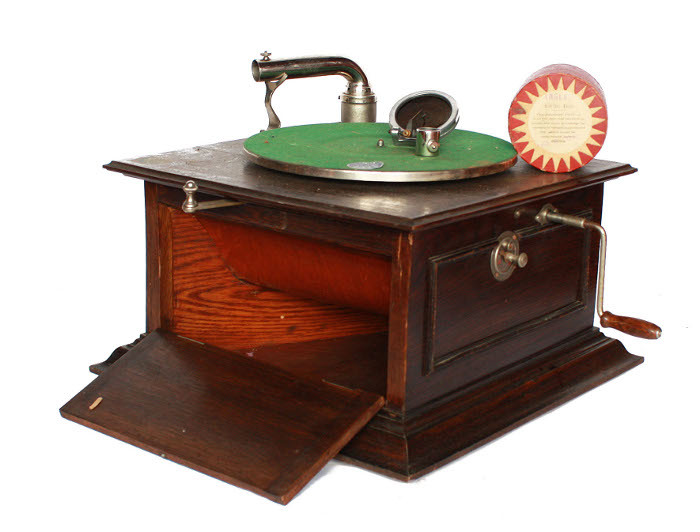 The unusal tone-arm is a later feature, probably inherited from the World Record concern, which AV took over about 1924-5. Table grand. 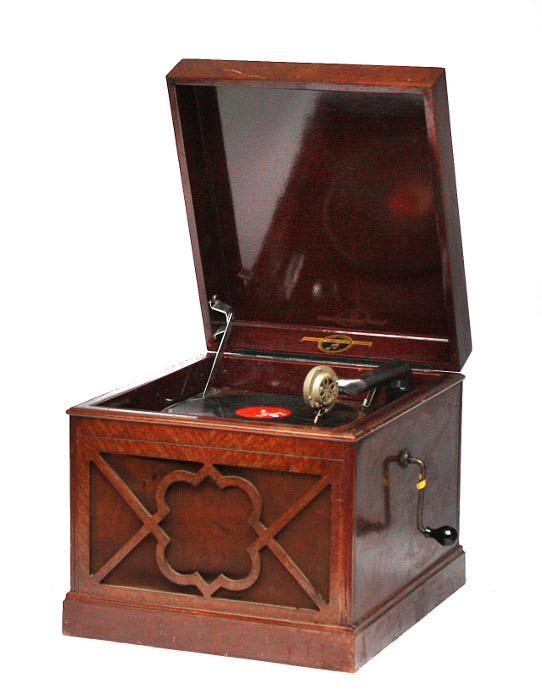 Square oak case, rotatable AV soundbox on (not original) square section tone-arm. 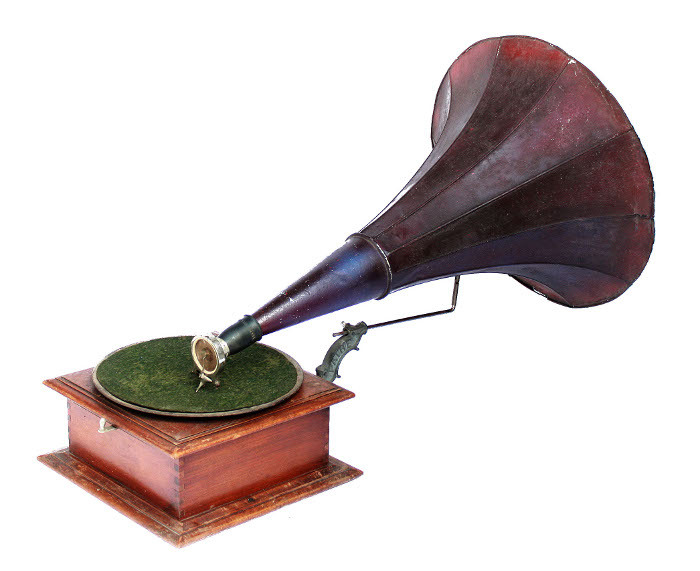 Model D or (with Graduola tone-control) EE. Table grand. 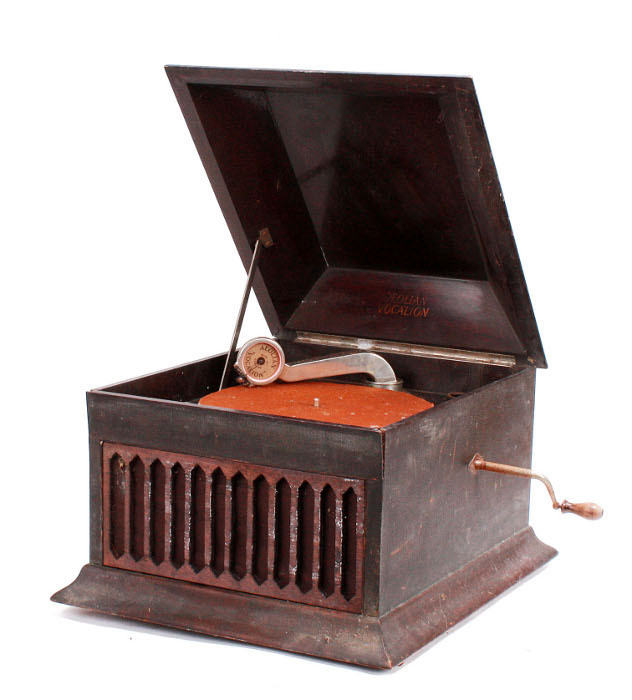 Mahogany case, AV soundbox. Portables. 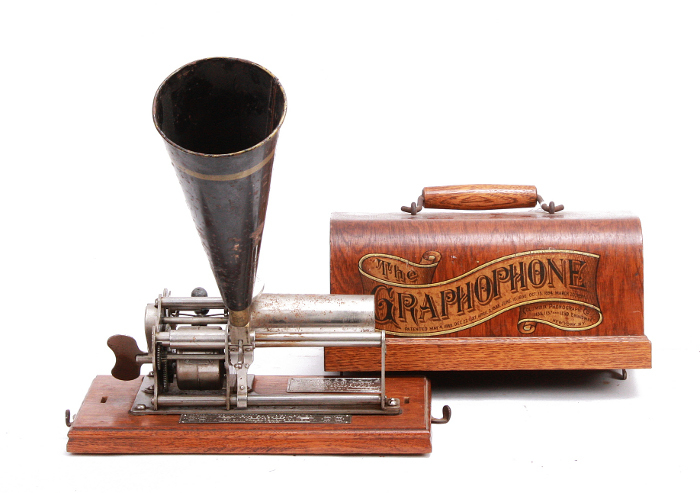 Left-square oak case, Beltona Tournaphone soundbox, horn in lid. Right-Incomplete. 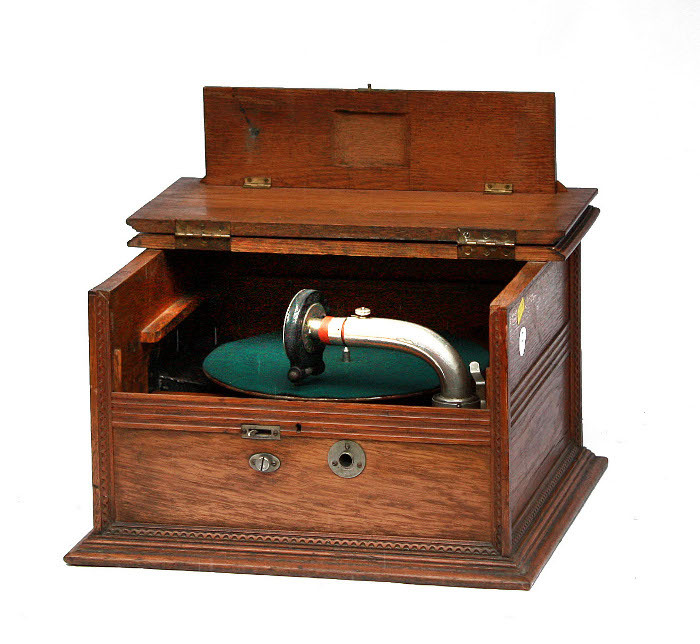 Columbia type C graphophone, Triple spring motor, six inch mandrel, light oak case with hinged front. 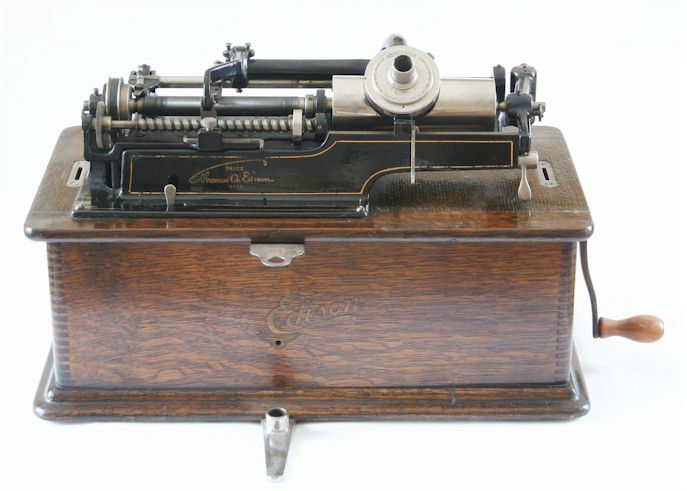 Columbia type AT graphophone, crank wound double spring motor, floating reproducer, Oak case and lid. Shown with Bettini attachment. 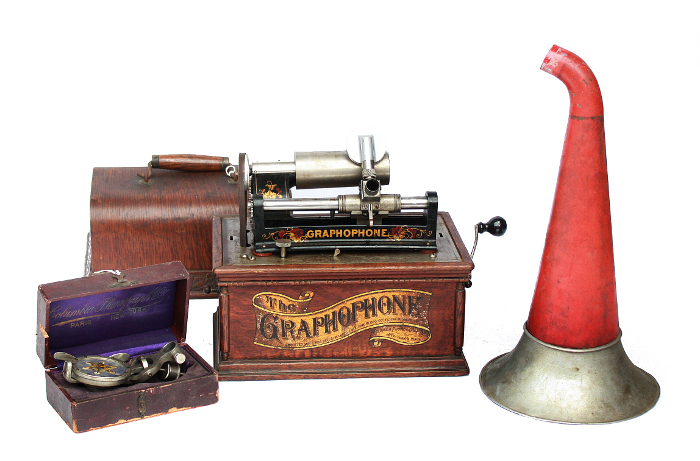 Columbia type BE graphophone, Lyric reproducer, Triple spring motor, Oak case and lid. 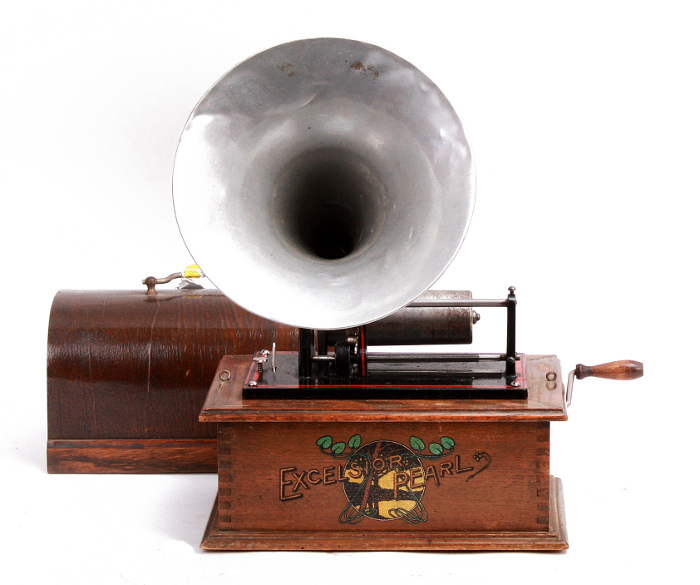 Columbia type B graphophone, Key wound double spring motor, floating reproducer, Oak base with bentwood lid. 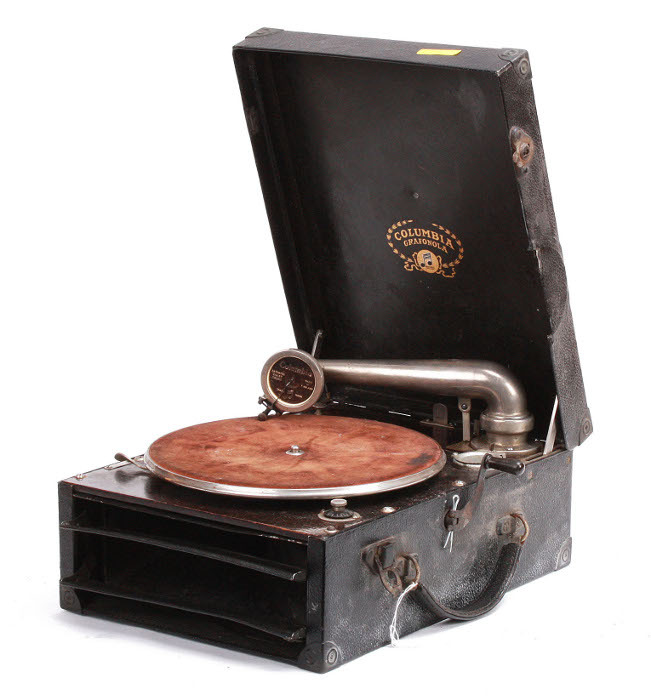 Columbia type AA graphophone Crank wound double spring motor, floating reproducer, Oak case and lid. 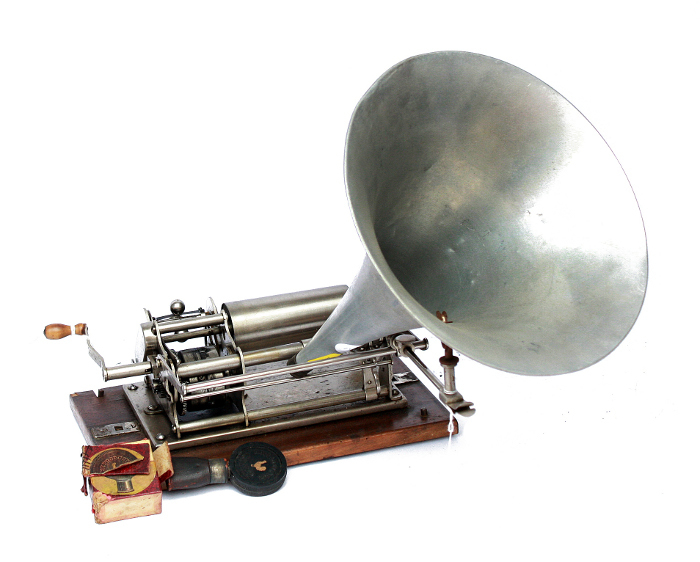 Columbia type AO graphophone 'Analysing' reproducer, Triple spring motor, Oak case and lid. 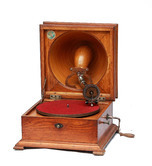 Columbia Twentieth Century Premier graphophone type BC, Higham reproducer, Triple spring motor, Six inch mandrel, Oak case with front flap and oak lid. 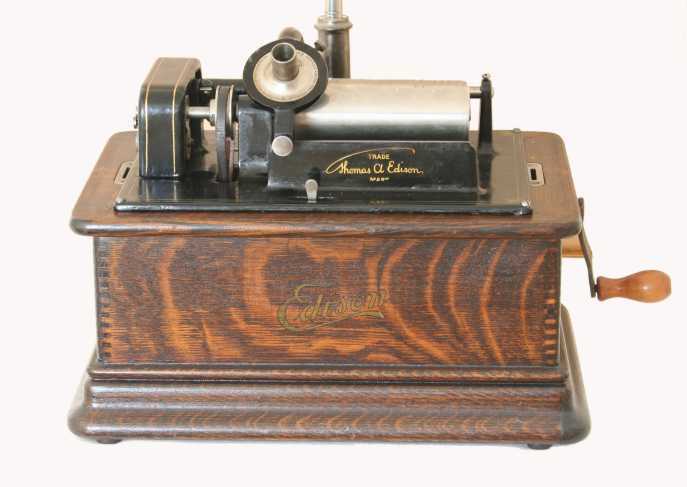 Edison Gem Model A. Introduced in 1901. 2 minute. Branded lid. Special GEM reproducer, modelled on the Automatic. With a smaller carrier arm eye, the reproducer is dropped in, turned to the right and locked by two knurled screws. 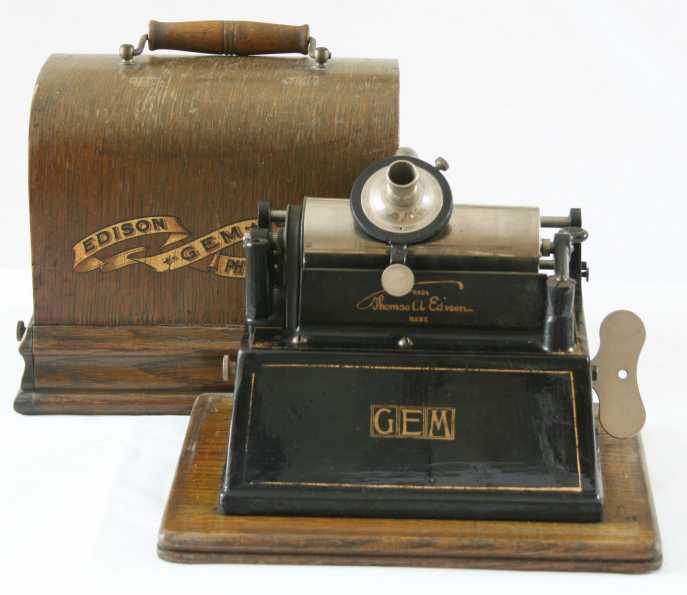 Edison Gem Model D. Introduced in 1909. The only Gem designed from the outset to play 2/4 minute cylinders. Maroon body and 19 inch straight maroon horn made in two parts that screw together. Edison Home Model A. Edison Home Model A showing lid in place. 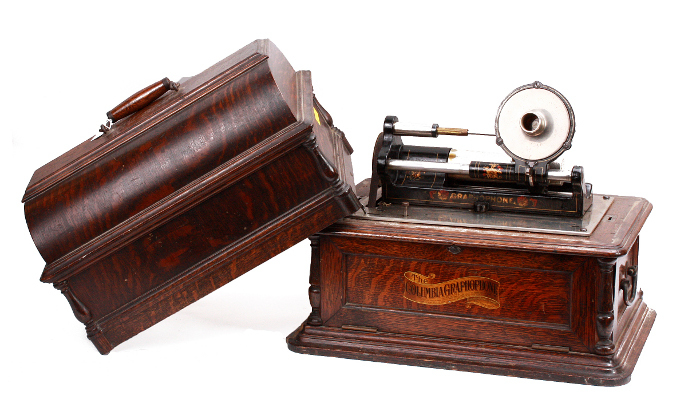 Edison Standard Model A. Introduced in 1898. 2 minute. Cabinet with square corners and flat topped lid secured with suitcase clips. 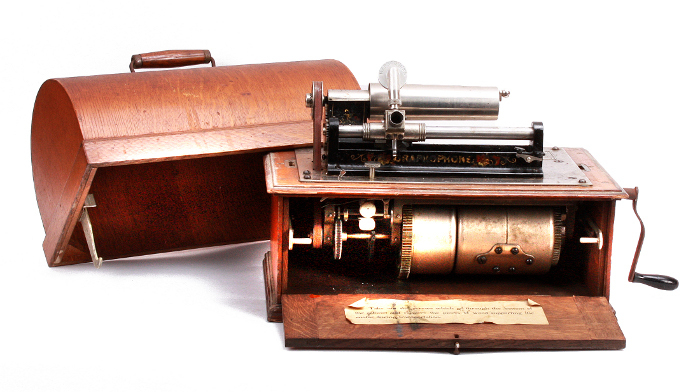 Edison Standard Model B. 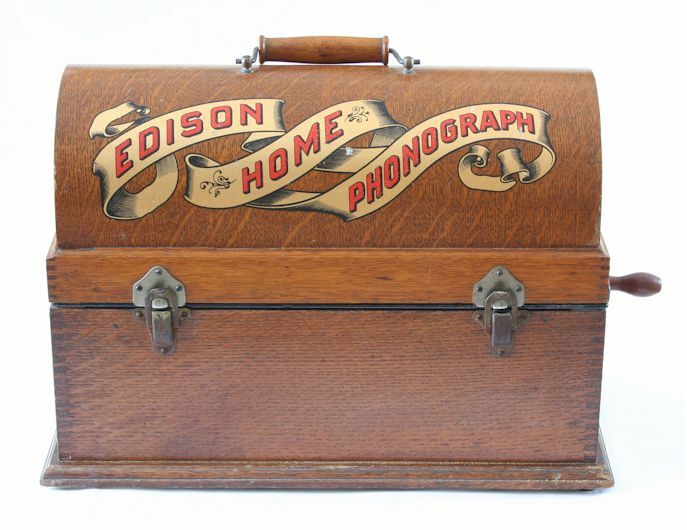 'Edison' decal model introduced in 1906. 2 minute. 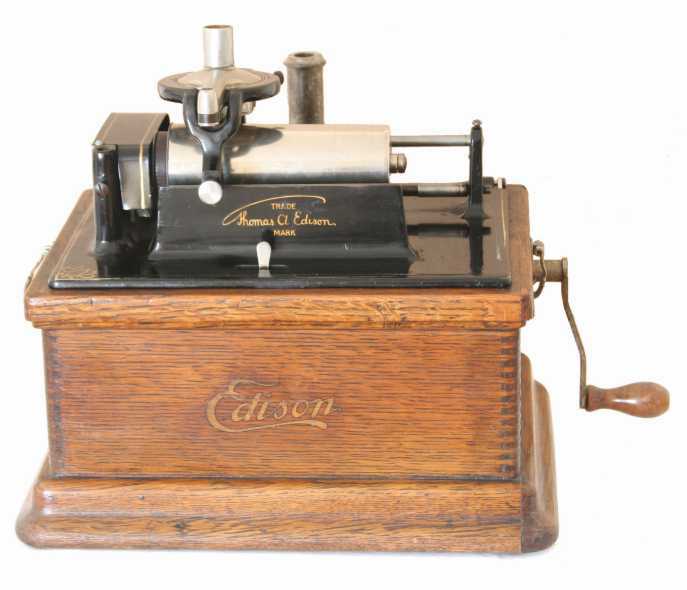 Edison Standard Model D. Introduced 1908. 2/4 minute. Single spring. C/H reproducers. 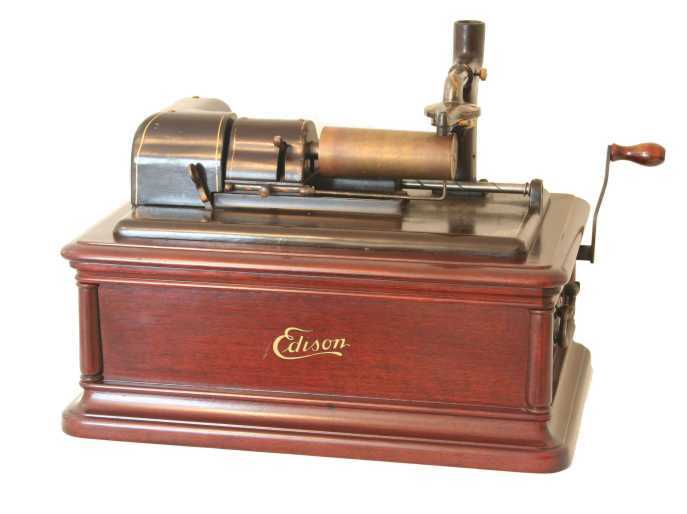 Edison Fireside Model A. Introduced 1909. 2/4 minute. Lid secured by end clips. Single spring. K reproducer. 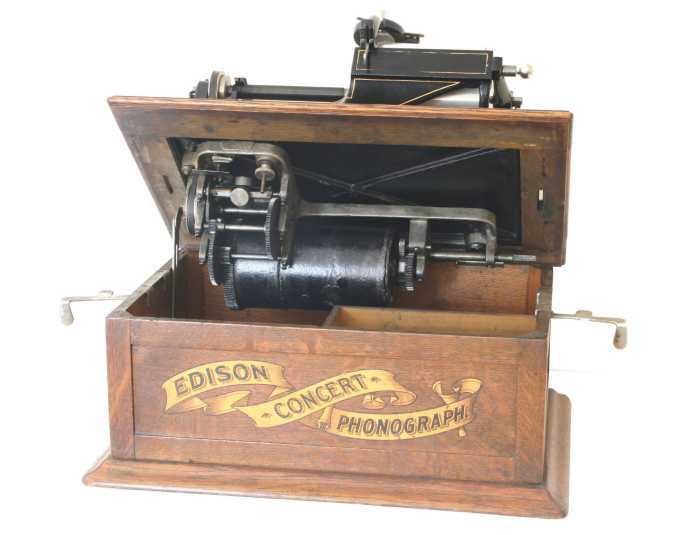 Edison Concert (Banner Transfer)Introduced 1901. 2 minute. Triple spring Triton motor. Edison Spring Motor. Introduced in 1895/6. 2 minute. Triple spring motor. Fully enveloping lid. 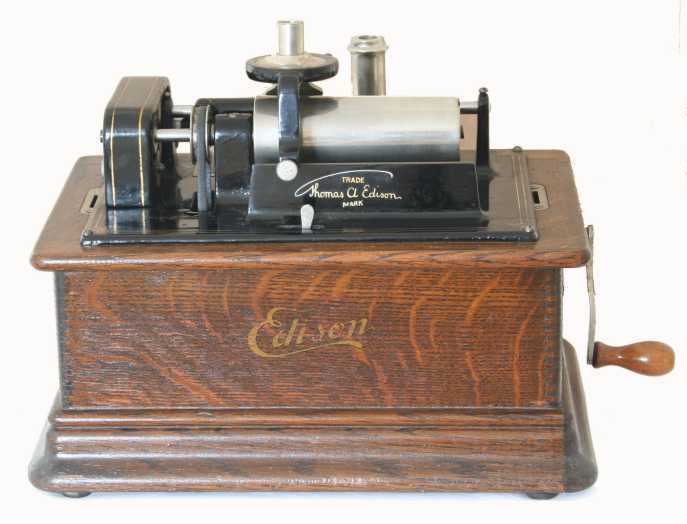 Edison Gem Model A. 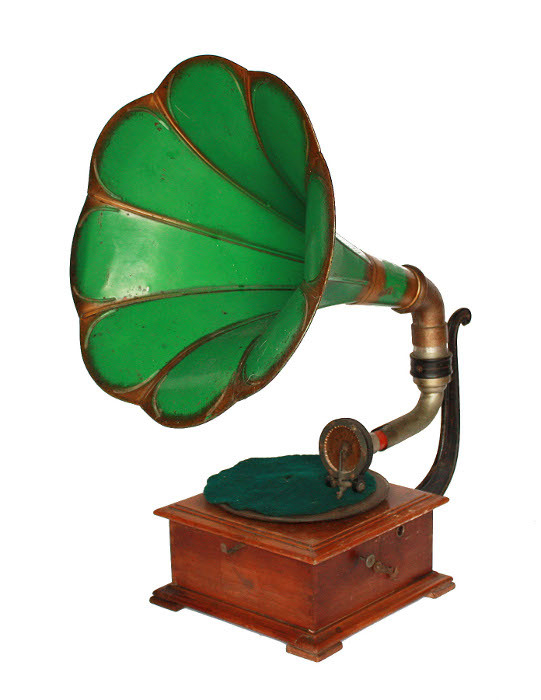 The third in the series of "Gem" phonographs circa 1903 known as a "key-wind" Gem although still listed as the Model A. 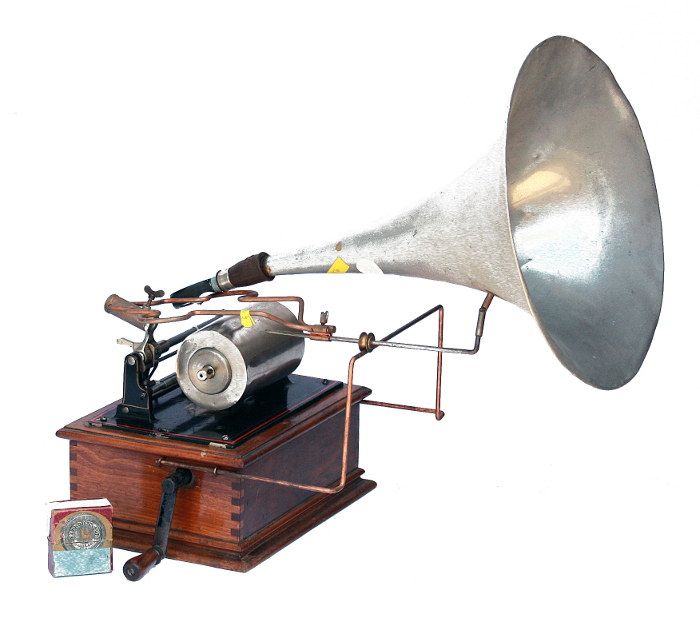 The horn sold with the machine was 10 inches long, conical and enamelled black but an all brass horn and support could be purchased as an optional extra. 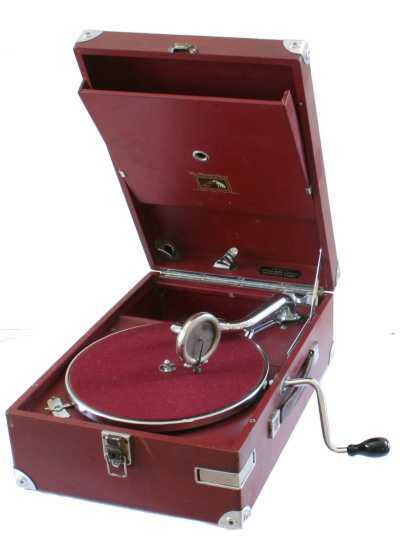 It was supplied with the so called "New-style" case and cost £2. 15s. 0d in 1903. 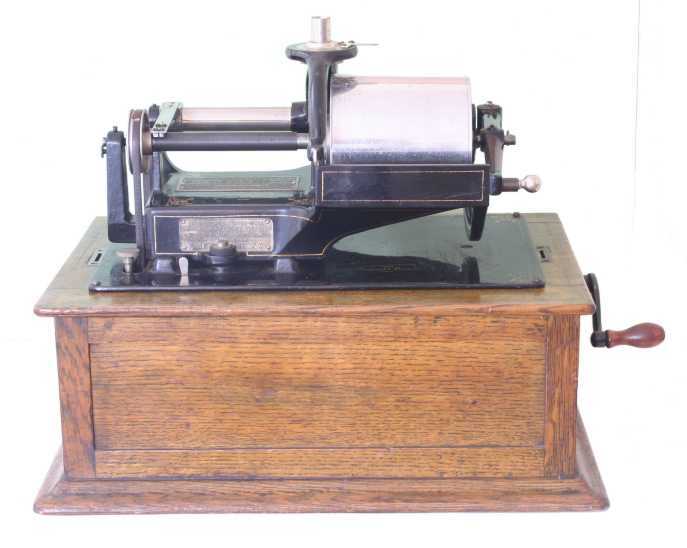 Models factored by Edison Bell in the UK had an embossed aluminium plate marked "Type 1 Gem"
Edison Home Model A. Introduced in 1896. 2 minute. 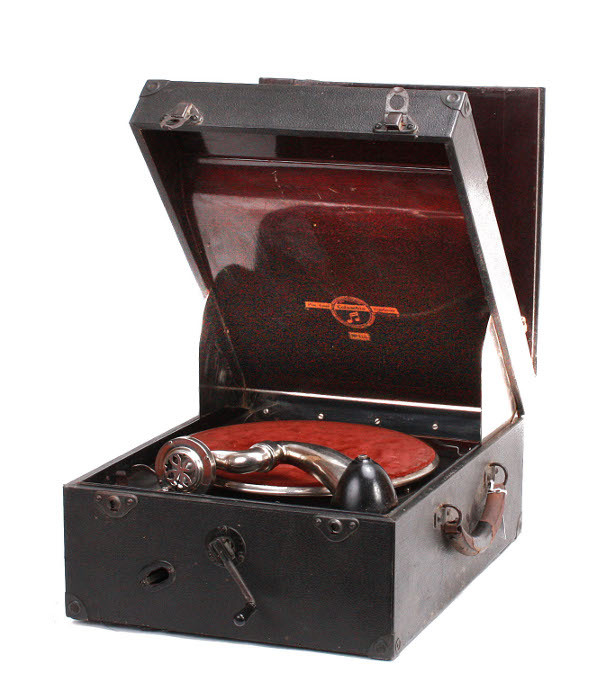 This early version of the model A is commonly called the 'suitcase' model due to the lid fastenings. 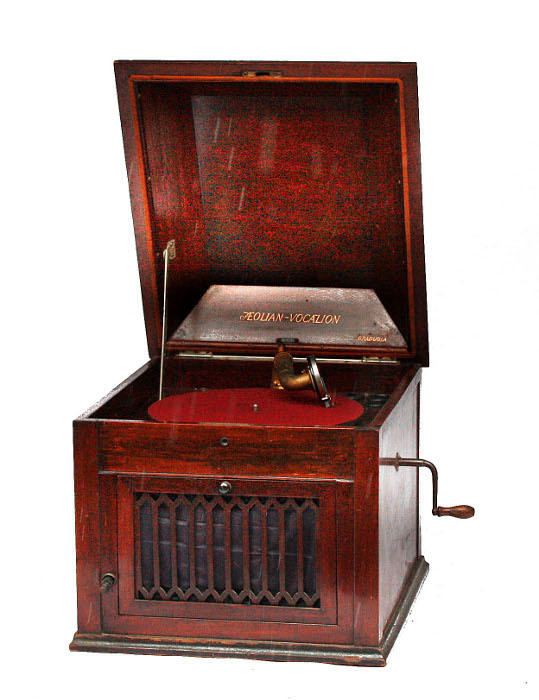 Edison Home Model B. 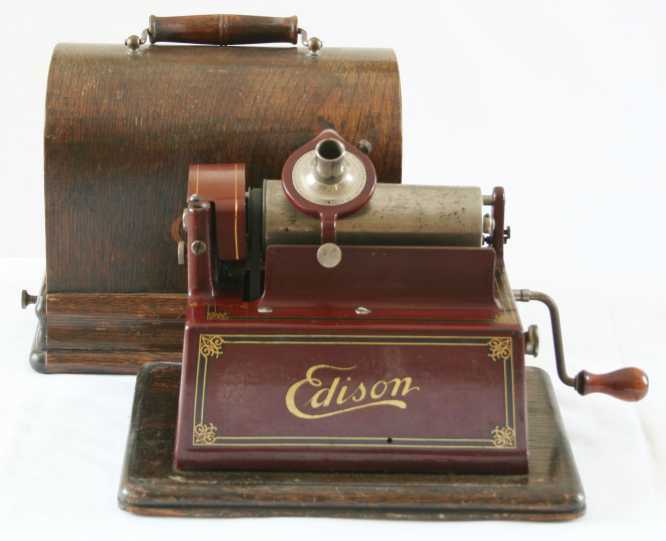 'Edison' decal model introduced in 1906. The machine illustrated has been upgraded to 2/4 minute operation. 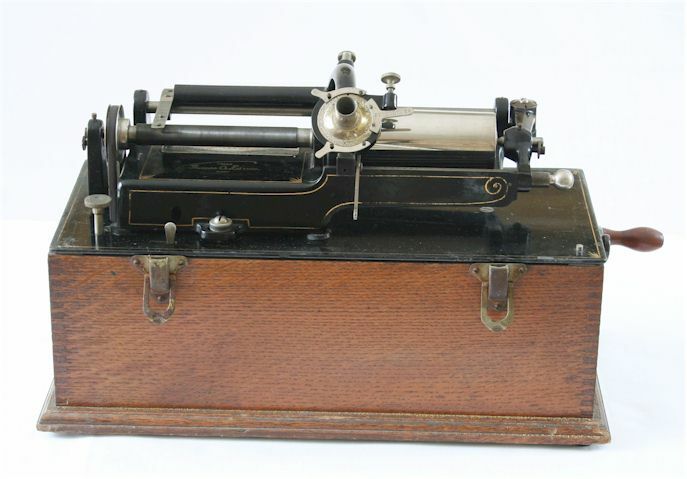 Also note the quite rare repeater attachment. 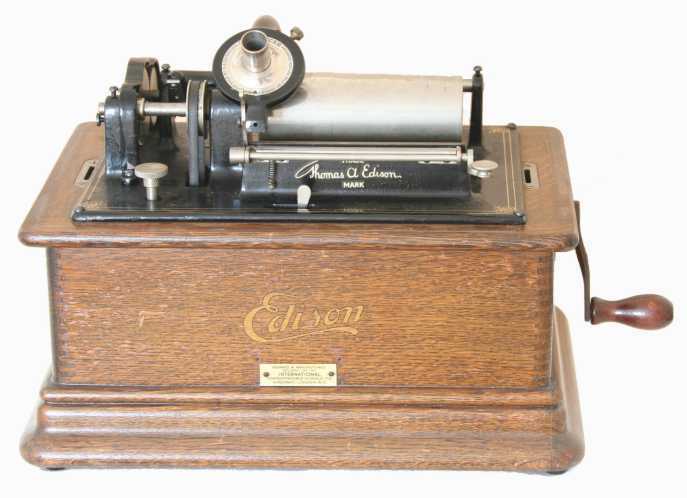 Edison Standard Model C. Introduced 1908. 2 minute. No swing arm. C reproducer. Single spring. 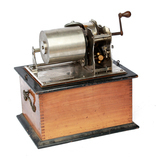 The machine illustrated is fitted with an ICS repeat lever. 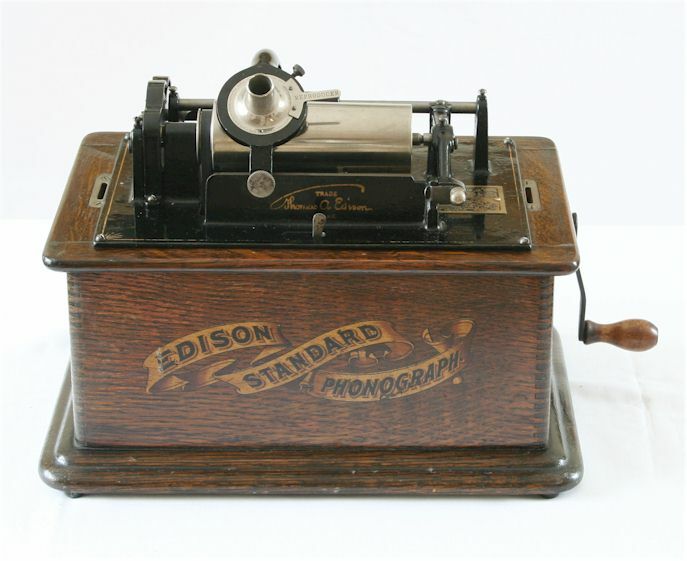 Edison Standard Model F. Introduced 1911. 2/4 minute. Has small reproducer eye set in the 'on top' position for R/S reproducers. 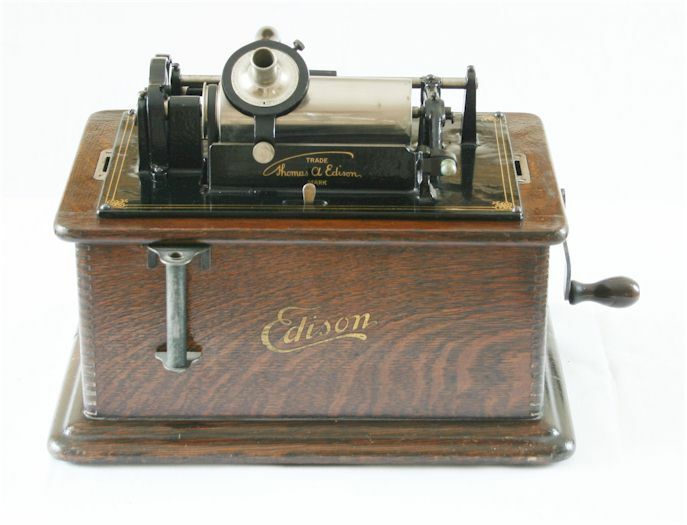 Edison Fireside Model B. Introduced 1912. 4 minute. Large carrier arm with reproducer traversing the top of the mandrel. N or Diamond B reproducer. 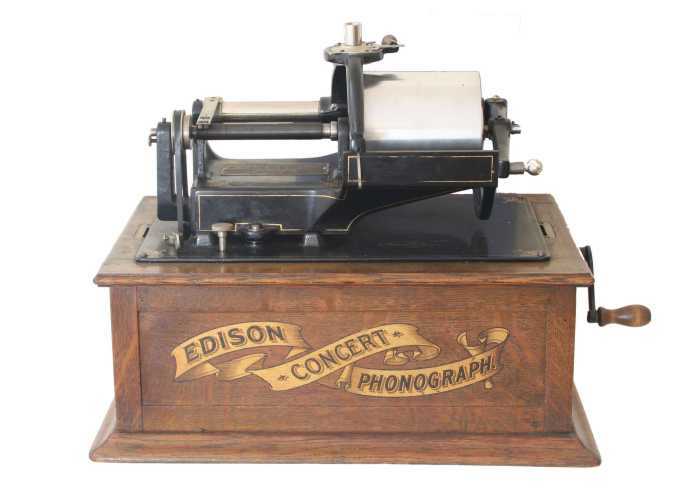 Edison Concert (Banner Transfer). Illustration of triple spring motor. 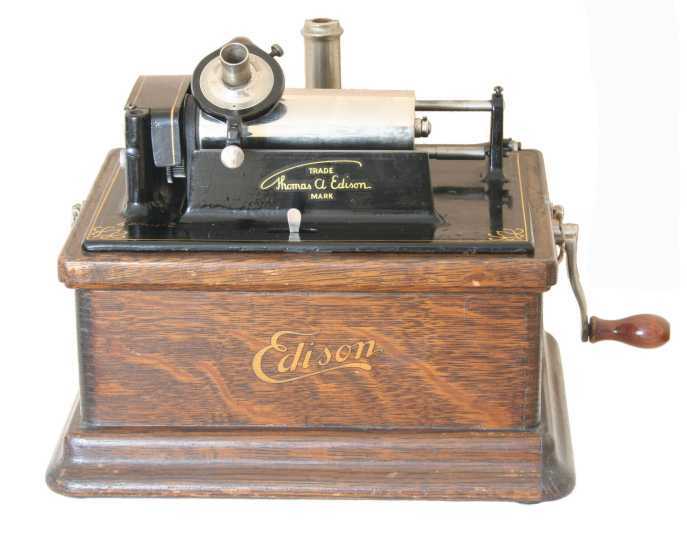 Edison Opera. Introduced 1911. 4 minute. 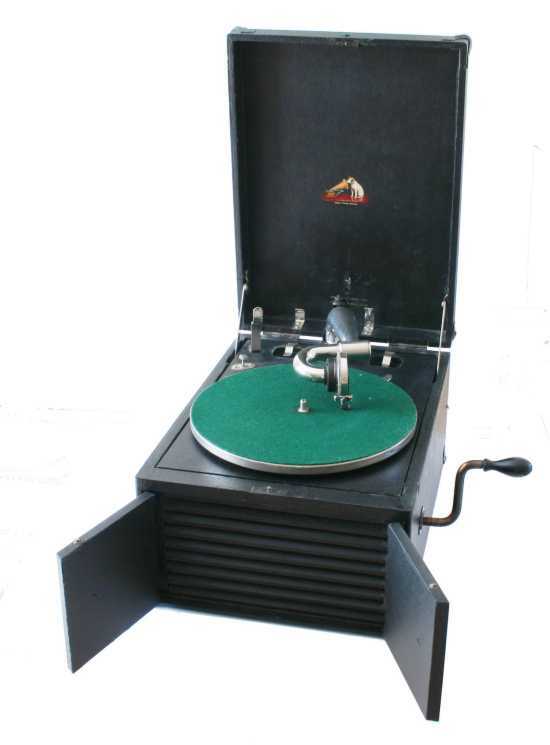 Model L or Diamond A reproducer. 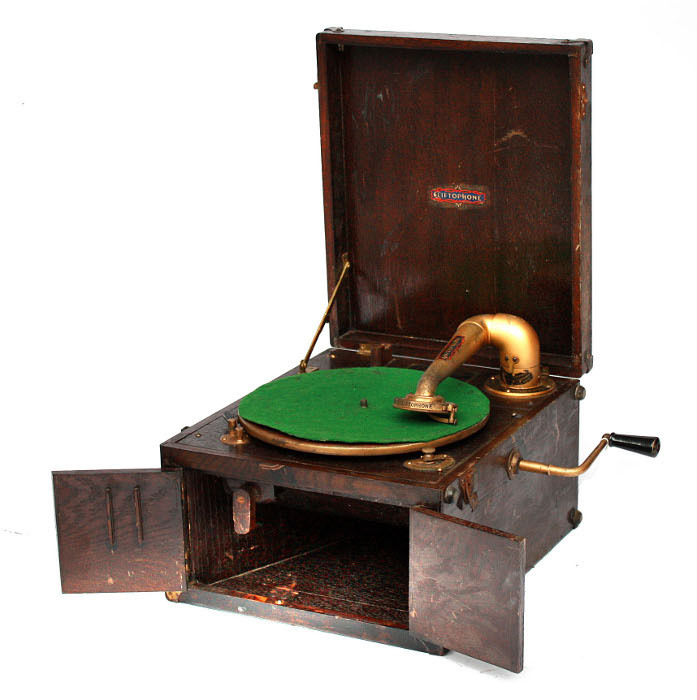 Discaphone table grand. 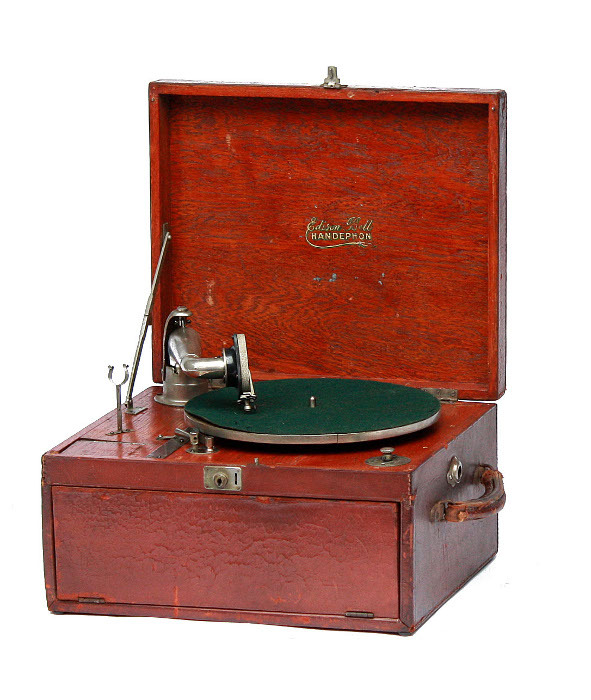 Mahogany case, Corona prince soundbox, tapered tone-arm, Swiss (Mermod) motor. 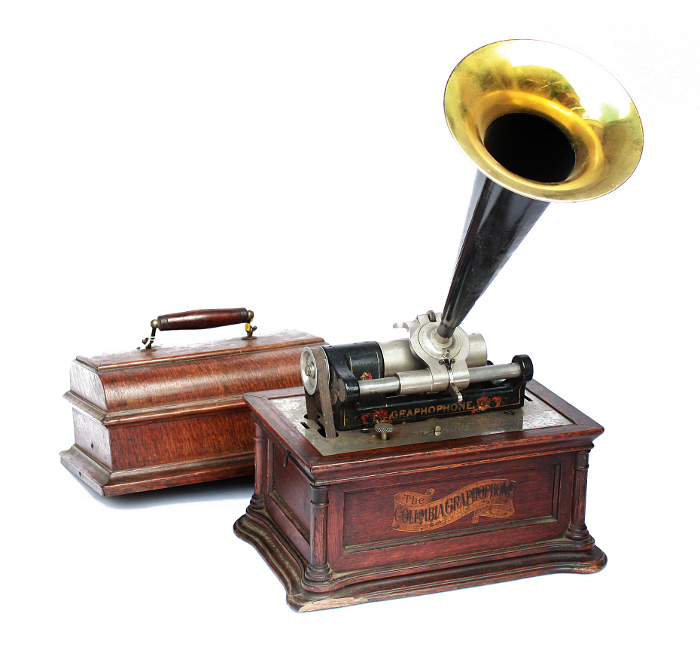 Handephon portable. 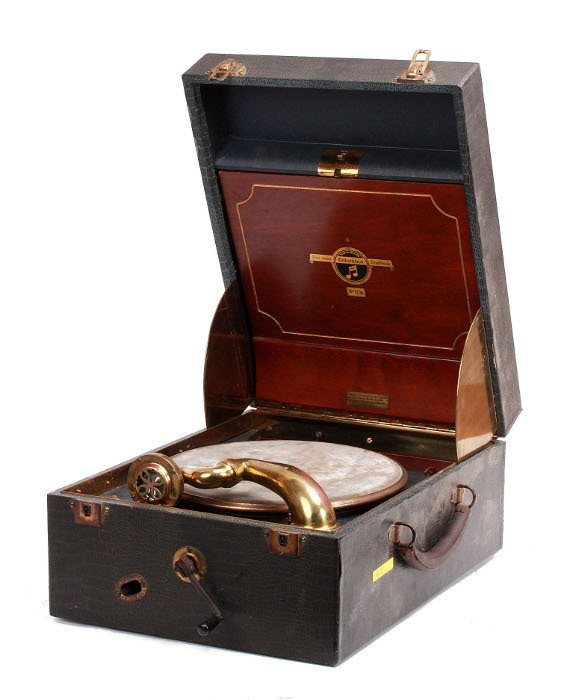 Hide covered oak case, Corona King soundbox, front flap enclosing horn and record storage. 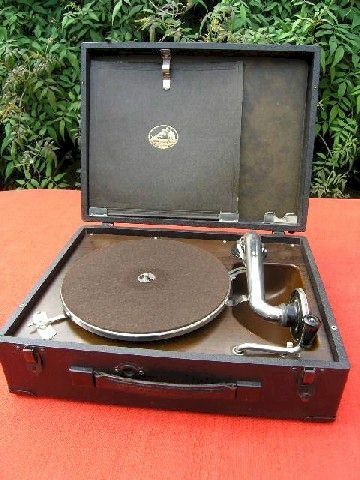 Electron portable. Model 390, Red lizard skin grained case, gilt fittings. Table grand. 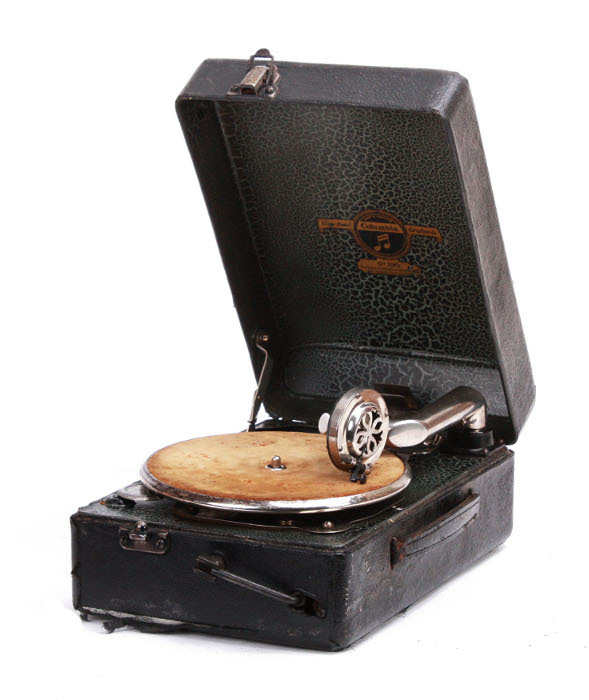 Oak case, Majestic soundbox, gooseneck tone-arm. 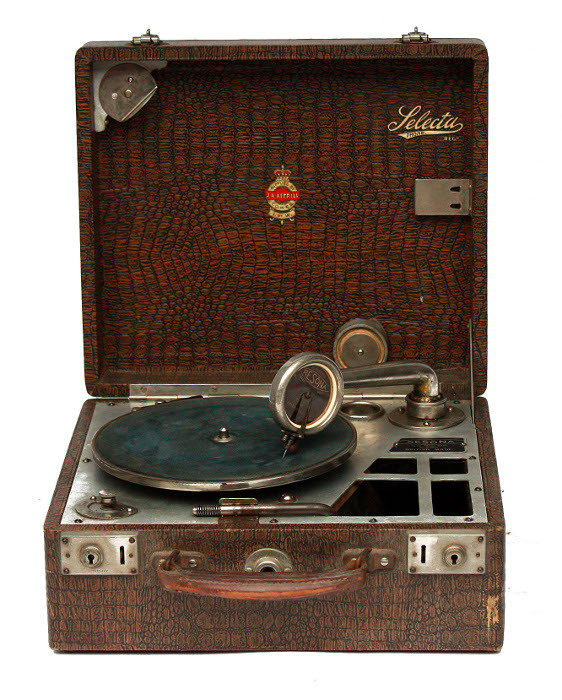 Electron portable. Model 345,Blue lizard skin grained case, Electrone soundbox on S shaped tone-arm. Picturegram portable. 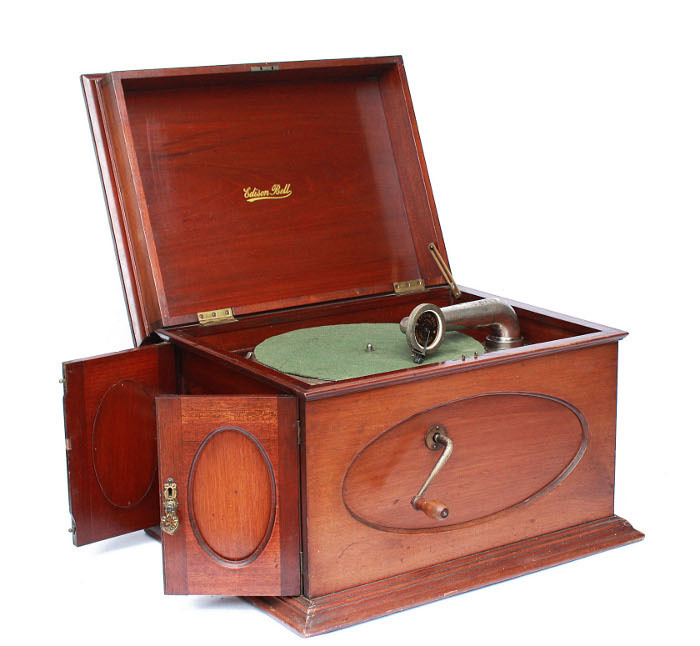 Electrone Junior soundbox, picture drive operated by pulleys and friction wheel from turntable. Edison Bell Concert. Introduced 1902. 2 minute. Single spring Home motor. Standard and slip on Concert mandrel. 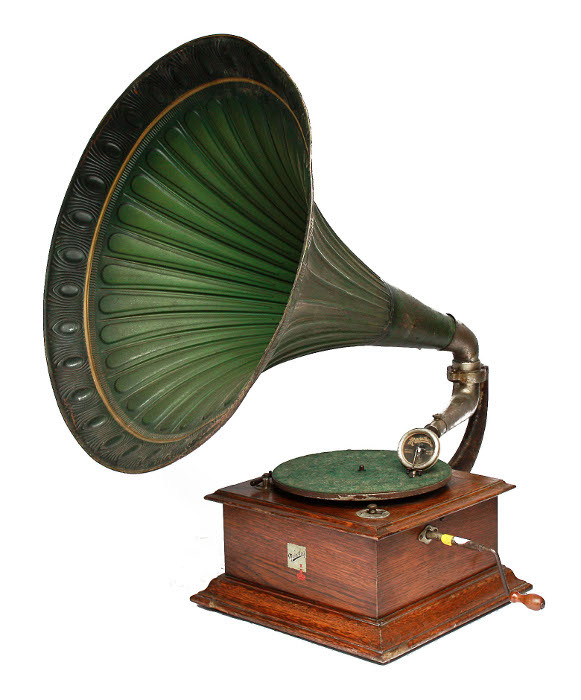 Edison Bell Duplex Grand. Open-works, nickel plated mechanism. Standard and slip on Grand mandrels. Walnut case, ebonised mouldings. Edison Bell Gem. New Model reproducer. Oak case with transfer. Bell medallion on bedplate. Edison Bell Concert. Illustration of Home motor. Edison Bell Imp. New Model reproducer. Oak case with transfer. Edison Bell Commercial. Electric motor, rubber covered mandrel, rear feedscrew with perforated belt drive, warning bell, swarf tray. Oak case with accessories drawer, steel lid. Circa 1893-1898. 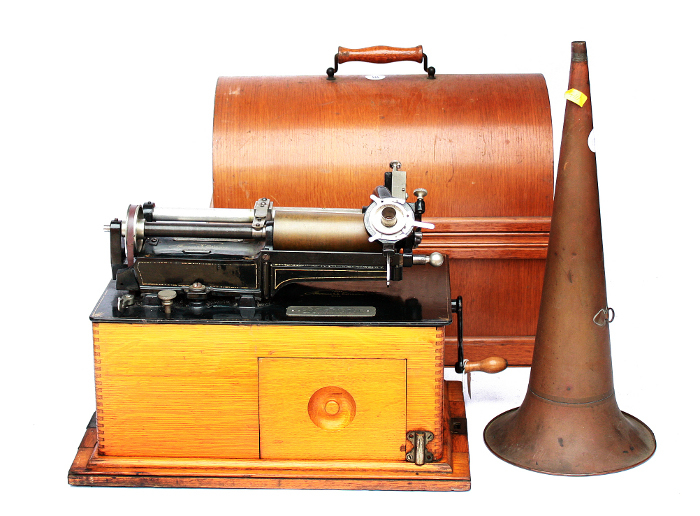 A selection of photographs of machines from this British Company circa 1919-1920's. Photos to come soon. 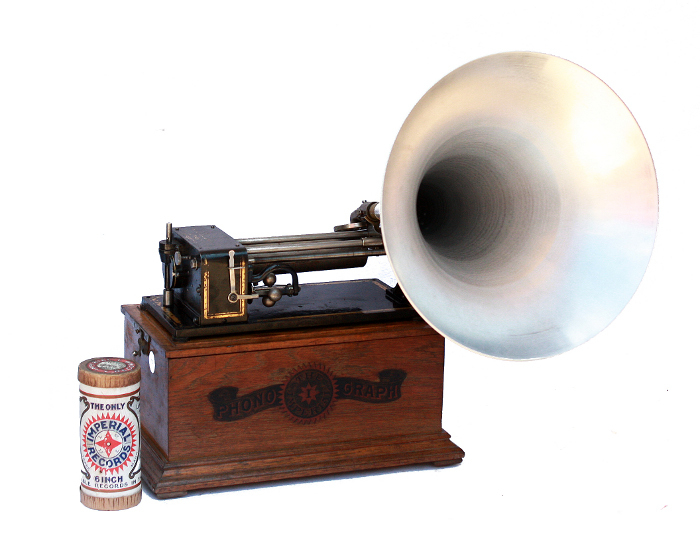 Excelsior Pearl phonograph. 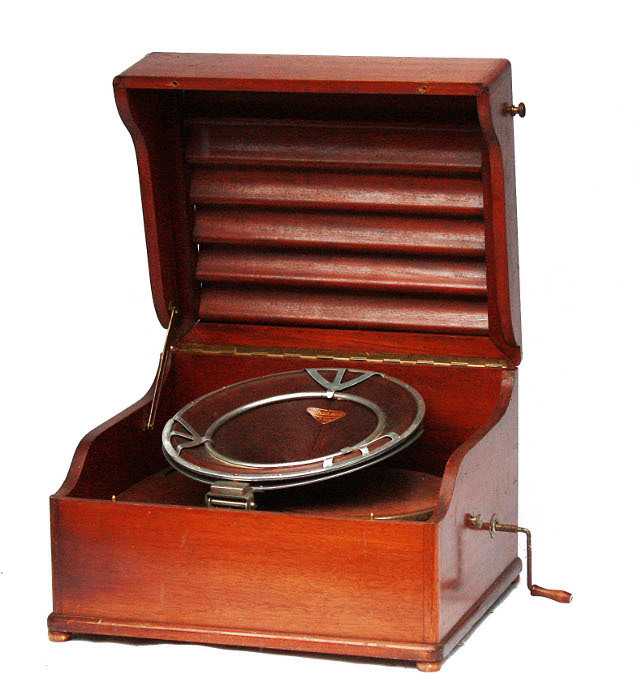 Floating reproducer, oak case with bentwood lid. 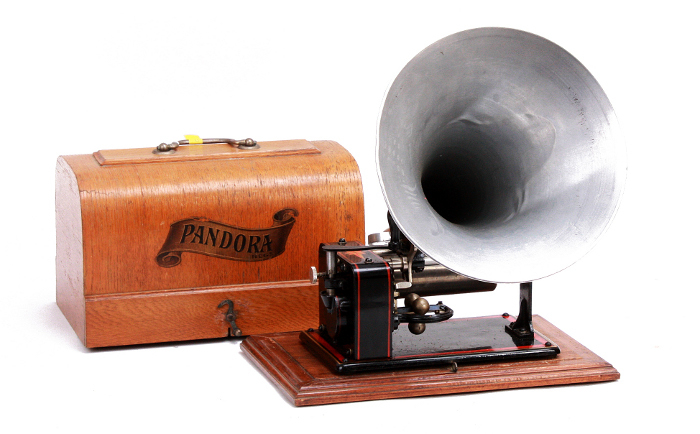 Excelsior Pandora phonograph (for Murdoch). Enclosed side motor with vertical crank wind, floating reproducer. HMV Model PAAO. 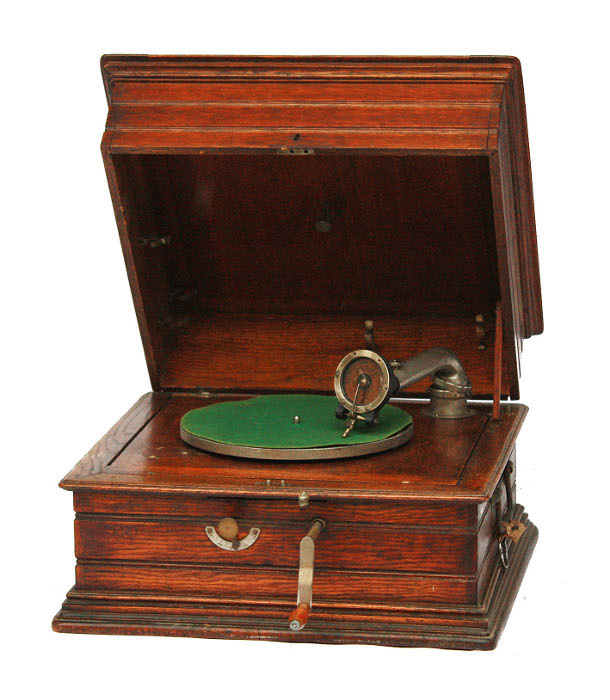 The first of the HMV portables. Introduced in 1920. Oak case. Fixed motor board. HMV Exhibition soundbox. 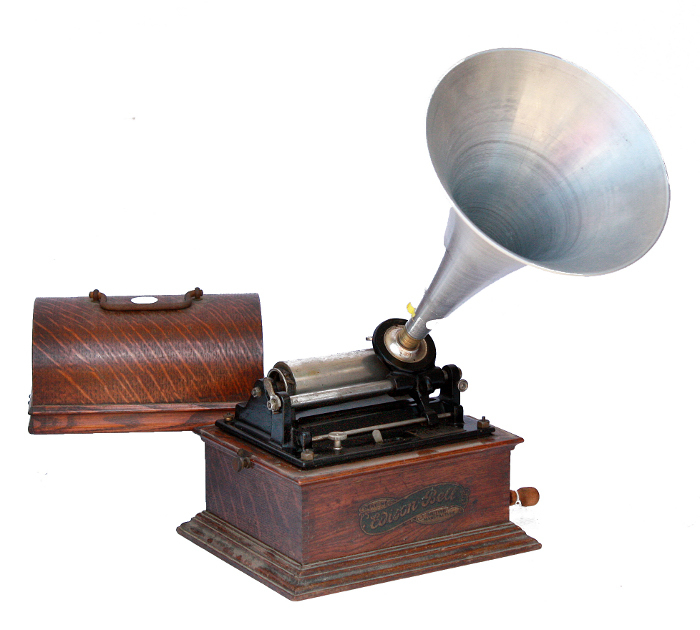 HMV Model PBC. Introduced in 1924/5. Black leathercloth covered case. Hinged motor board. 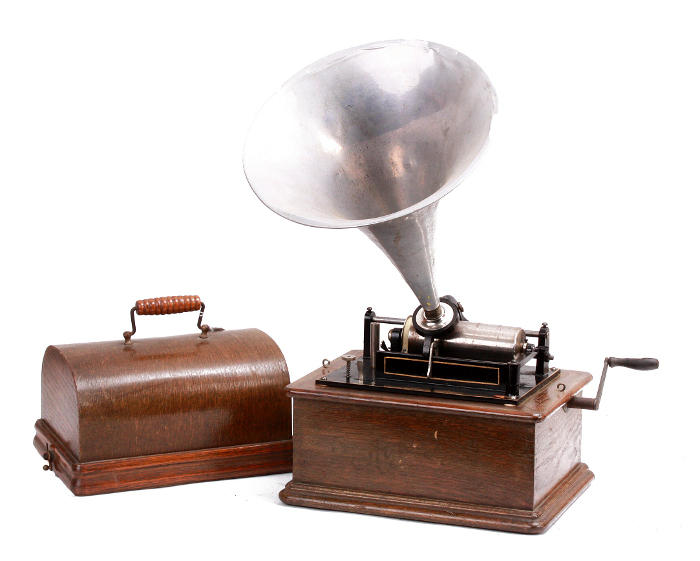 HMV Exhibition soundbox. 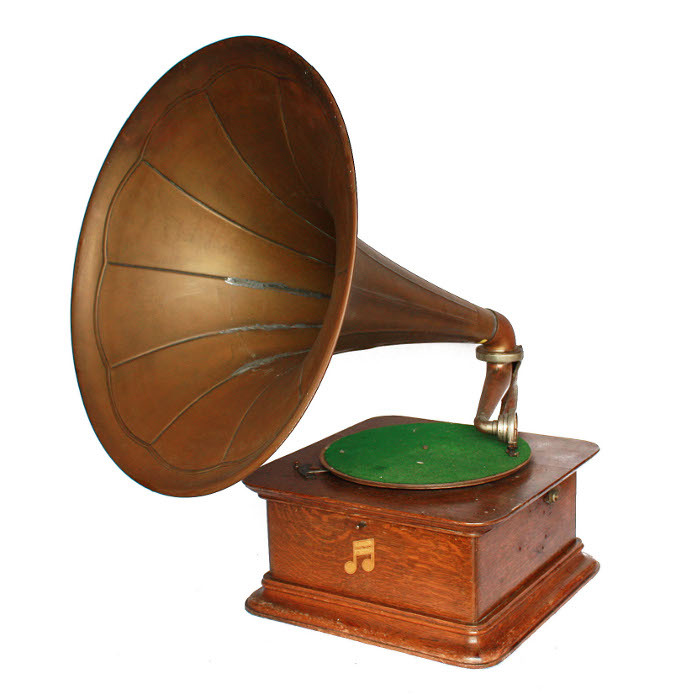 HMV Model 101. 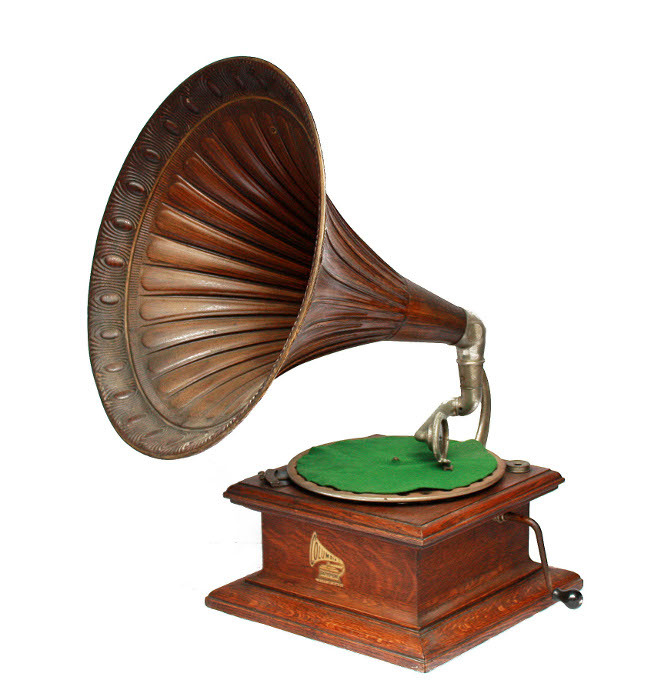 First version introduced in 1925. Winding handle at the front and needle bins located in lid on the left. No. 4 soundbox. 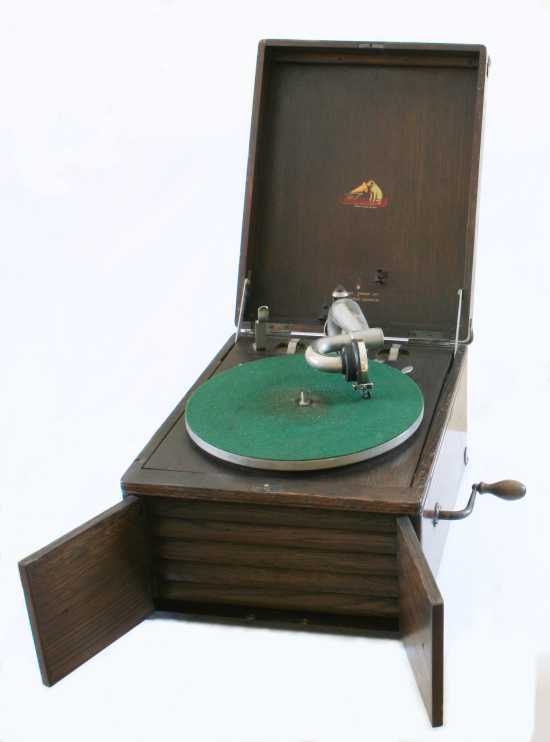 HMV Model 102. Introduced in 1931. Very long production run extending into the 1960's, during which time numerous changes were made to the original specification. Available in black and in many colours. 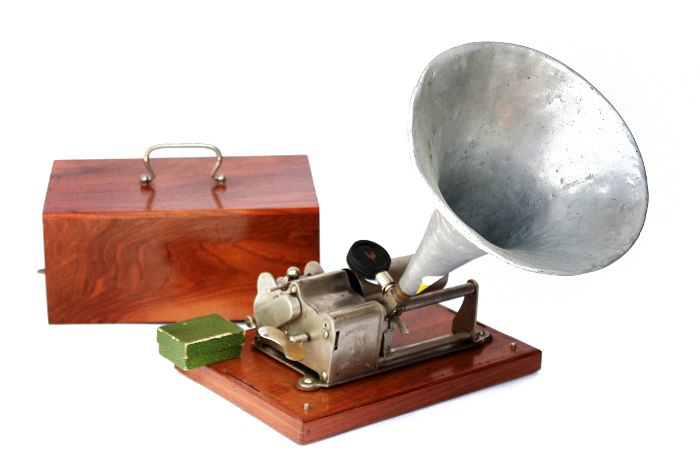 Original soundbox No. 16 then 5a then 5b. 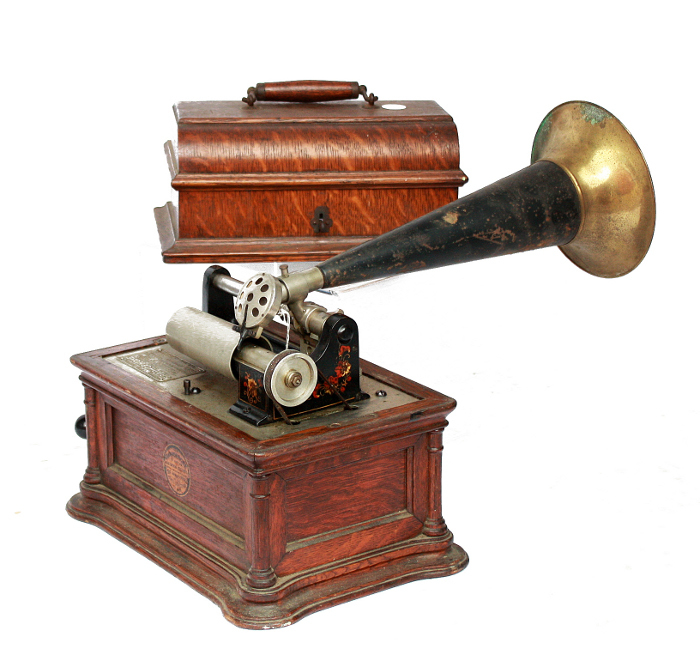 HMV Model PBO. Introduced in 1922. Oak case. Hinged motor board to allow the motor to recede into the cabinet when closed thereby reducing the overall height. 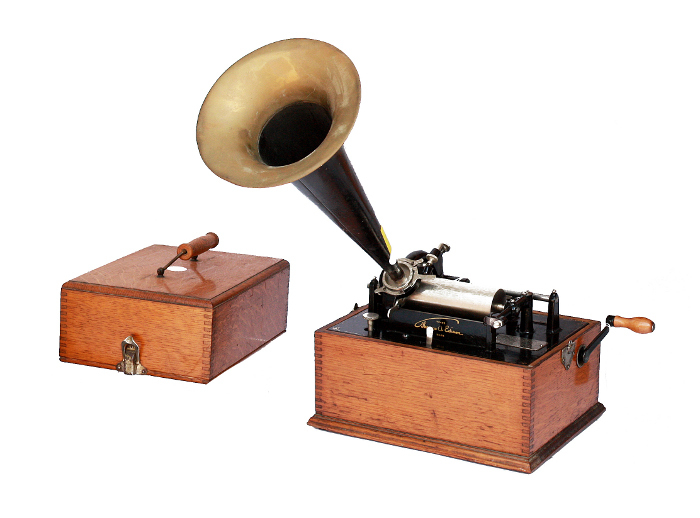 HMV Exhibition soundbox. 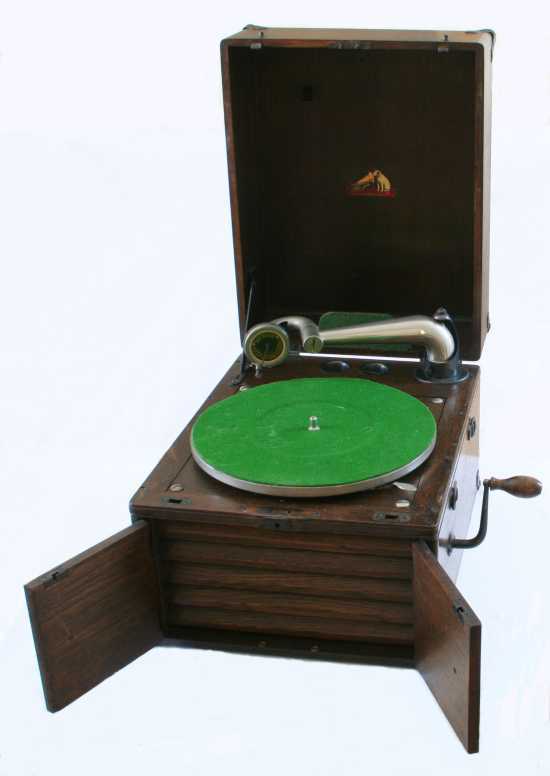 HMV Model 100. Introduced in 1924. The first of the compact portables. 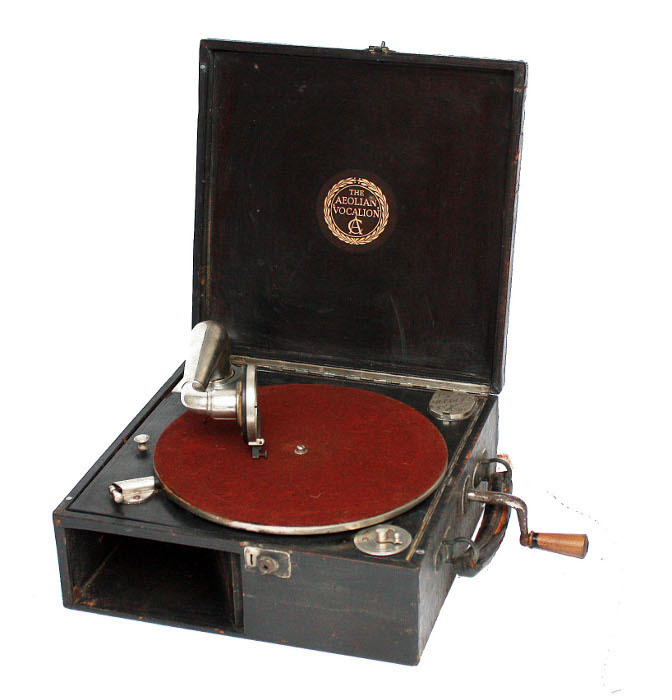 The tone arm rises to the playing position when moved to the right. Winding handle at the front and needle bins located in lid on the right. 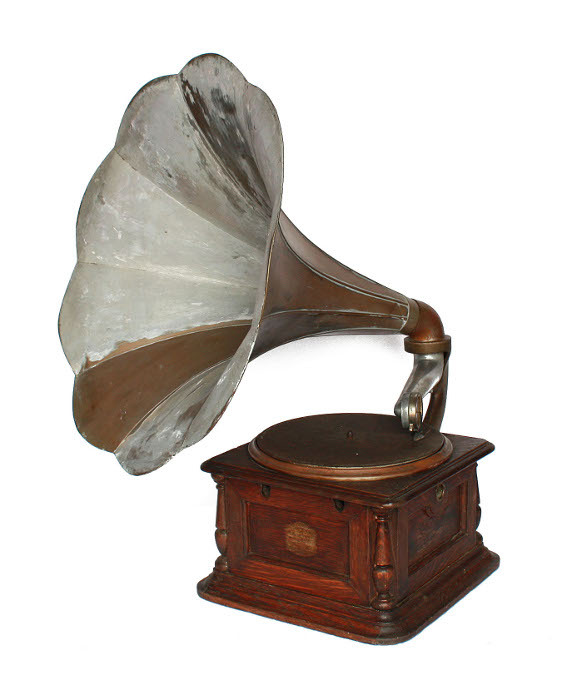 HMV Model 101. 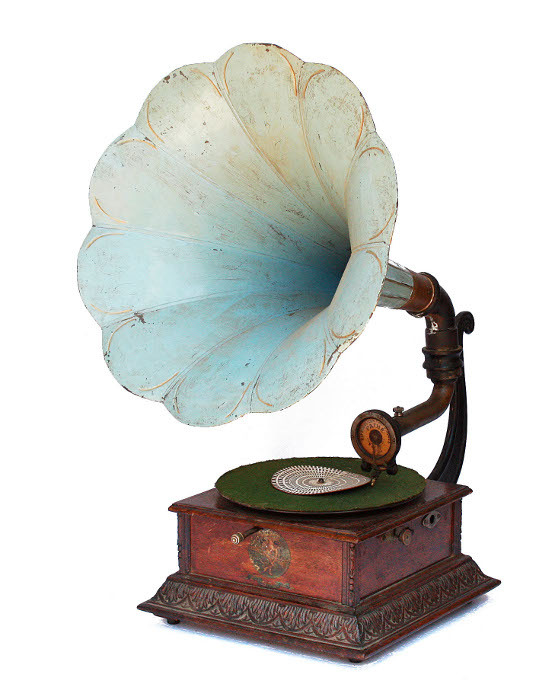 Side wound version introduced in 1927, in production until 1931. Available in black and in many colours over the years of production. No. 4 soundbox. 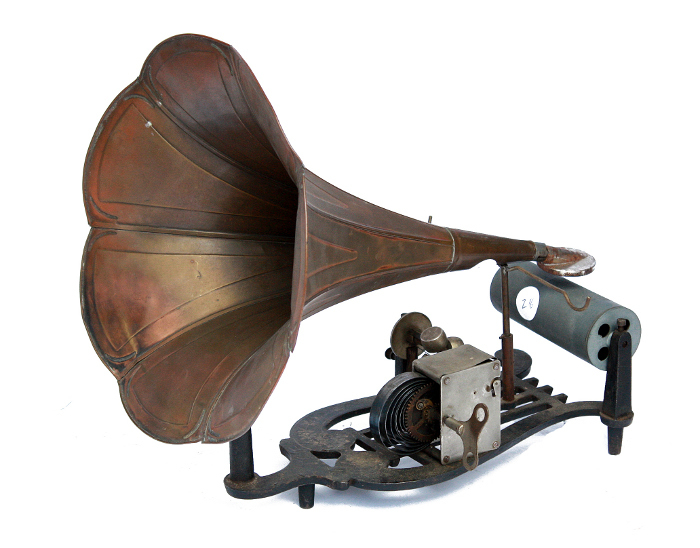 HMV Model 99. 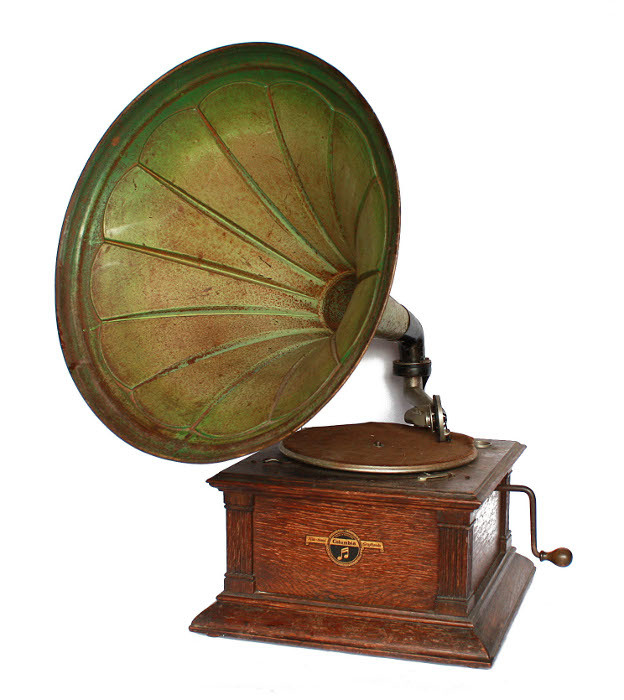 Introduced in 1931 as a cheaper model. Available in Black, red and blue. 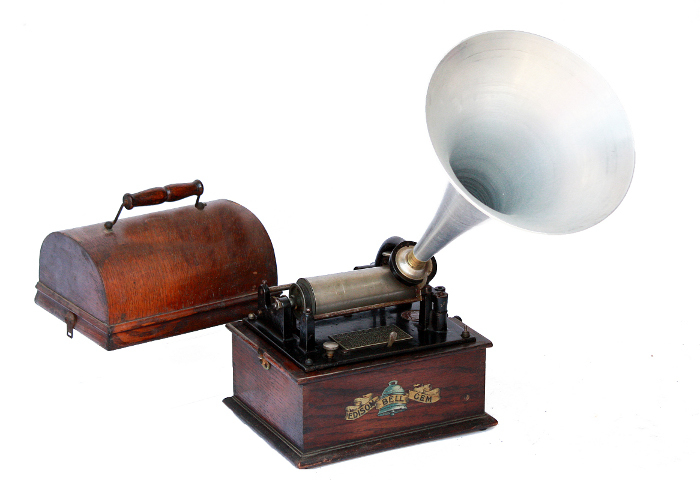 It is one of the few HMV machines to use a straight tone arm. No. 16 soundbox. 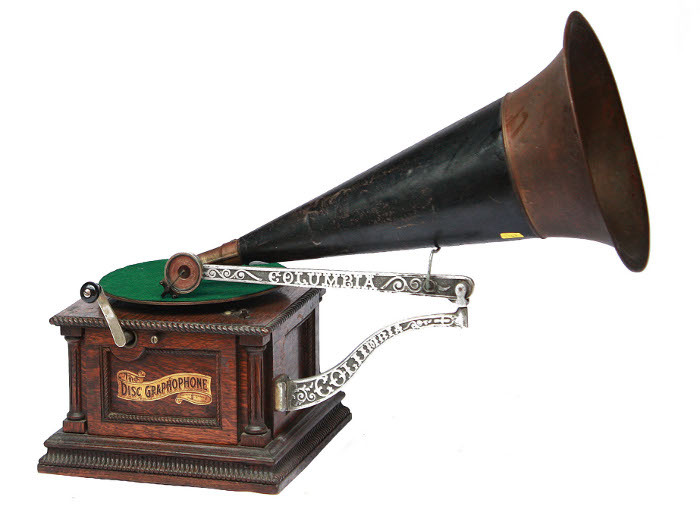 Lambert Companionphone Imperial phonograph. 6 inch mandrel, floating reproducer on Rawlinson's sound tight joint. top wind motor, reversible oak case. External. horn. 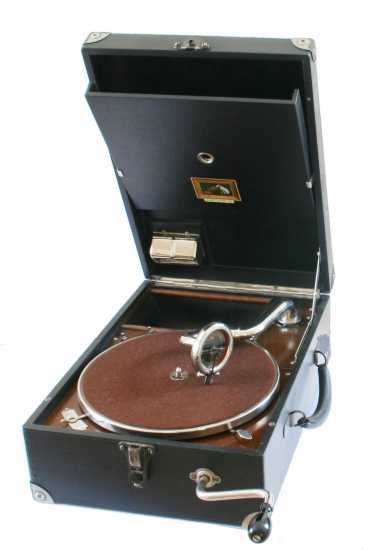 Oak case, Marathon soundbox on tapered tone-arm adaptable for lateral or vertical cut records, Thorens motor. 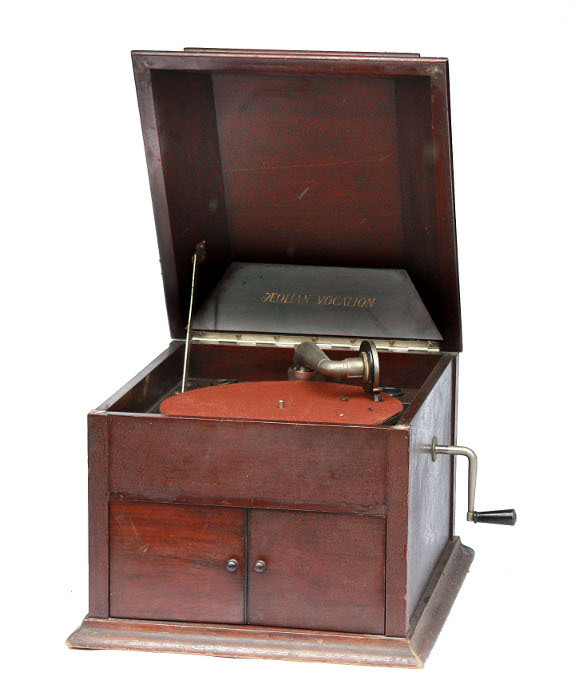 Murdoch Argosy phonograph. Spring tension reproducer, 2 and 4 minute gearing, Argosy No 11 transfer on case. Portable. Blue case, Orchorsol adjustable neck soundbox on swan neck tone-arm. 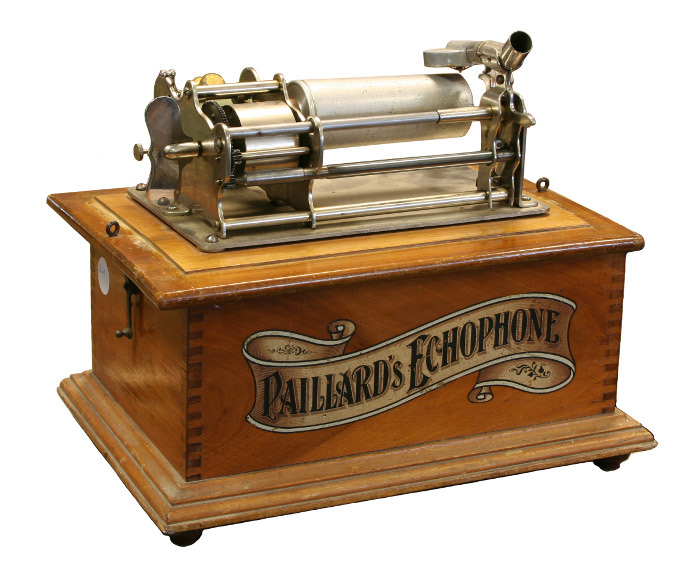 Paillard Echophone phonograph. Key wound open mechanism on baseboard, with lid. Floating reproducer. 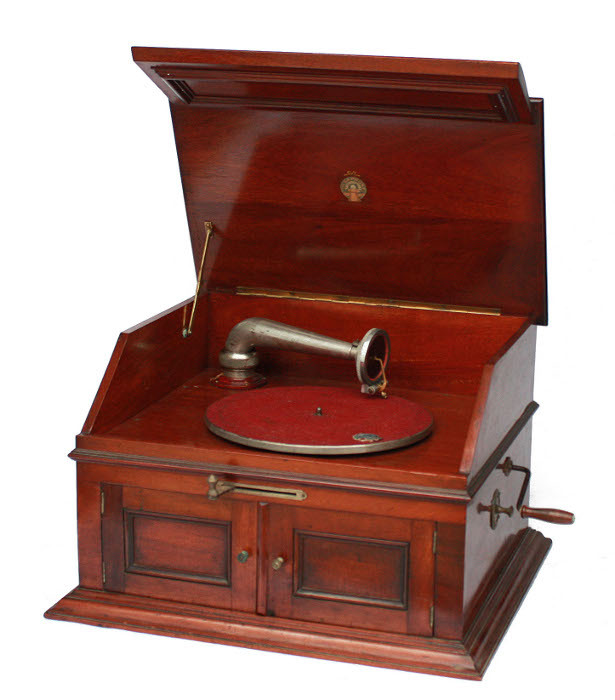 Pathéphone model A. Pathé reproducer, detachable two piece extension arm, 21 inch pivoted flower horn. 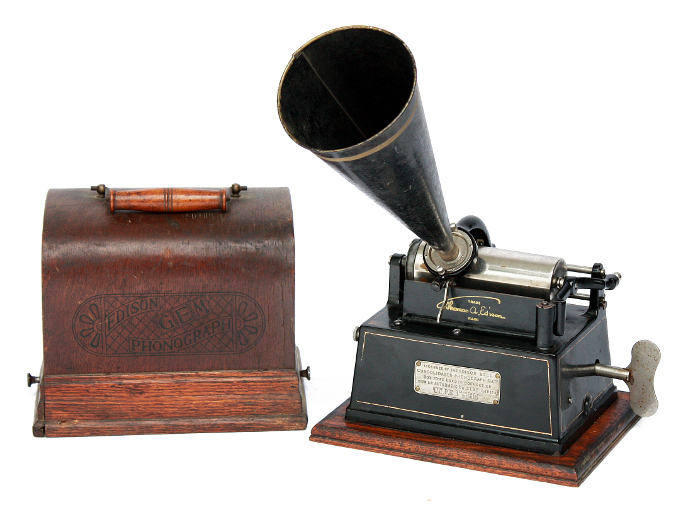 Pathéphone. Stained wood case, Ebonite reproducer. Pathéphone number 14 table grand. 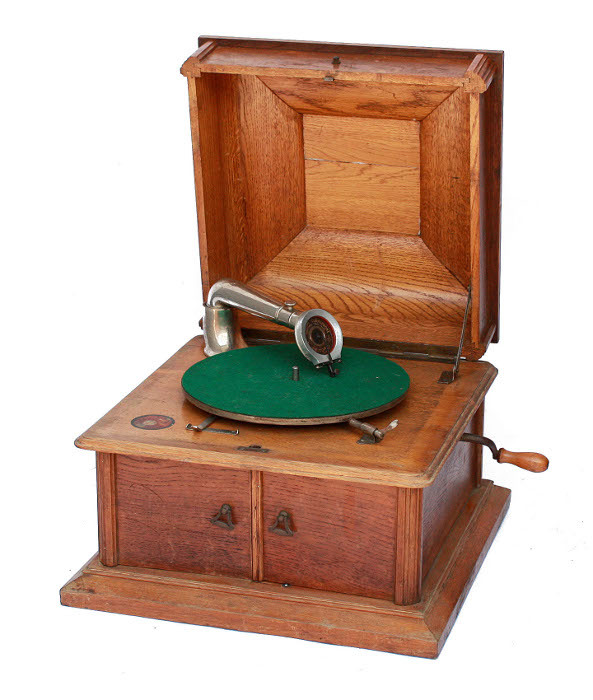 Oak case, Concert reproducer, tapered detachable tone-arm with spring counterbalance. Pathé Diffusor table grand. Walnut case with adjustable louvres in lid, conical card diaphragm in aluminium frame. 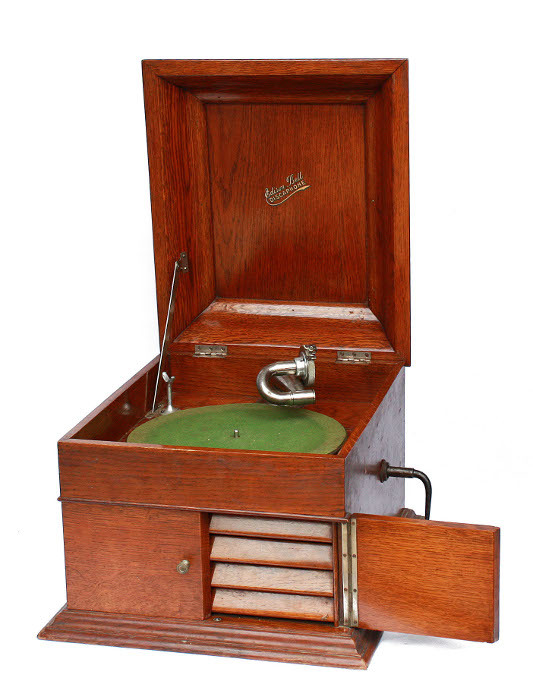 Pathéphone London portable. Light oak case with folding lid, wire loop handle at rear, Ebonite reproducer. 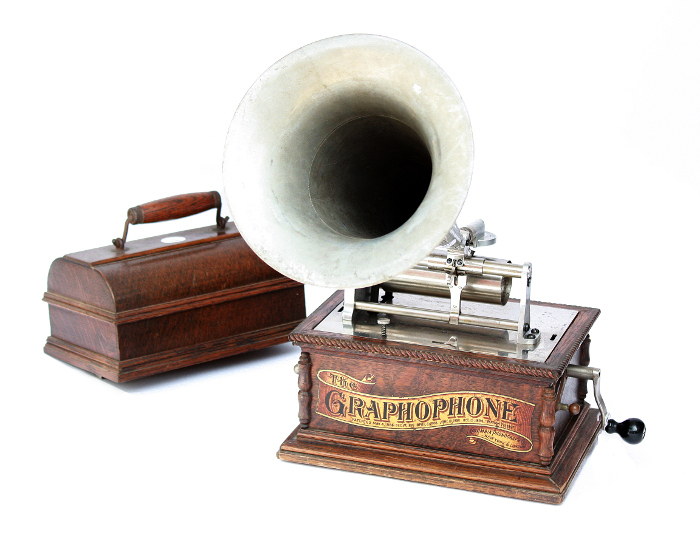 Pathéphone model 10. 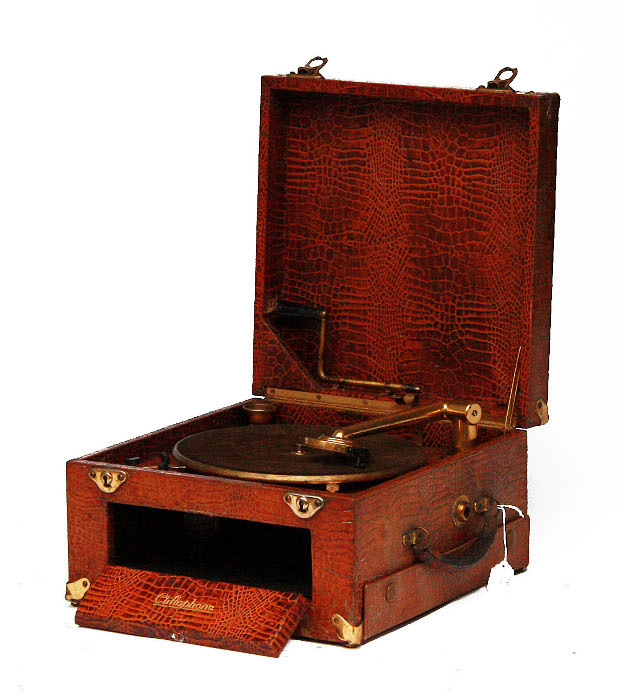 Mahogany case, Concert reproducer,10 inch turntable, brass flower horn. 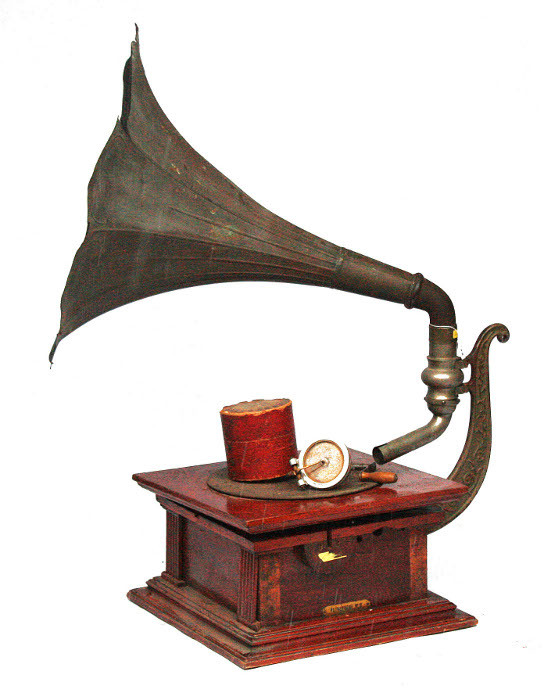 Pathéphone. Ebonite reproducer ,push-pull start lever. 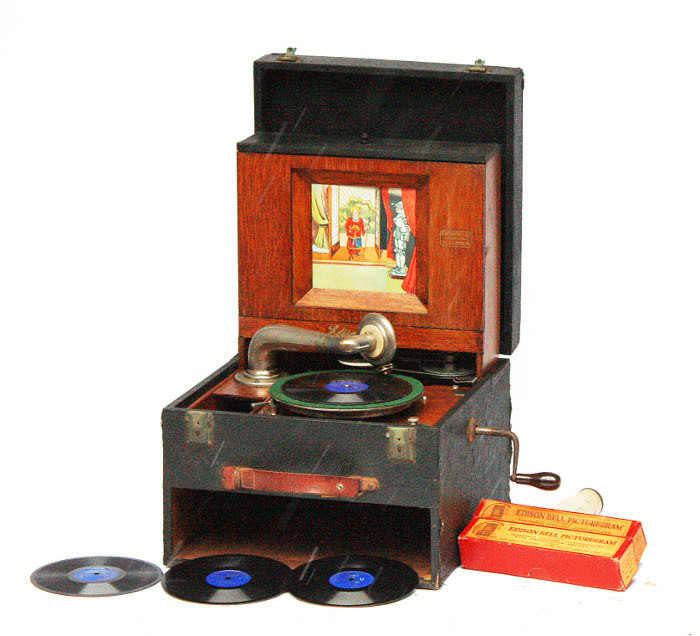 Pathé Elf table model. Light oak case, Ebonite reproducer on straight detachable tone-arm. Pathéphone portable. Oak case, metal carrying handle, Ebonite reproducer, sliding door to internal horn. Pathéphone Success hornless. 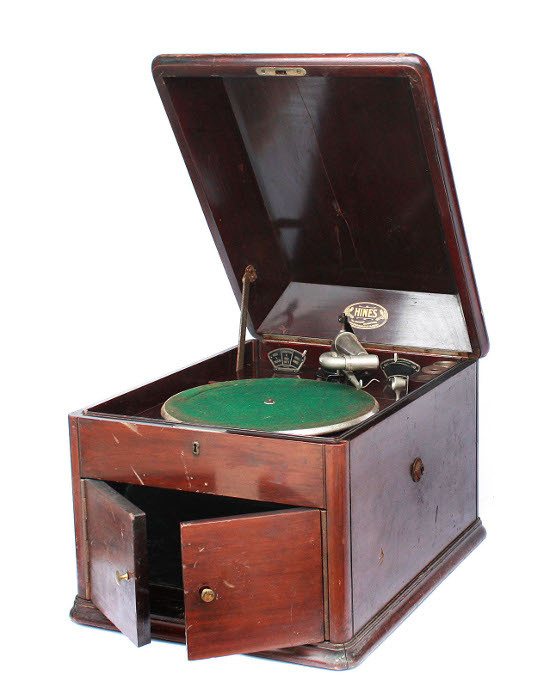 Oak case, Concert reproducer on detachable tone-arm, accelerating starter. 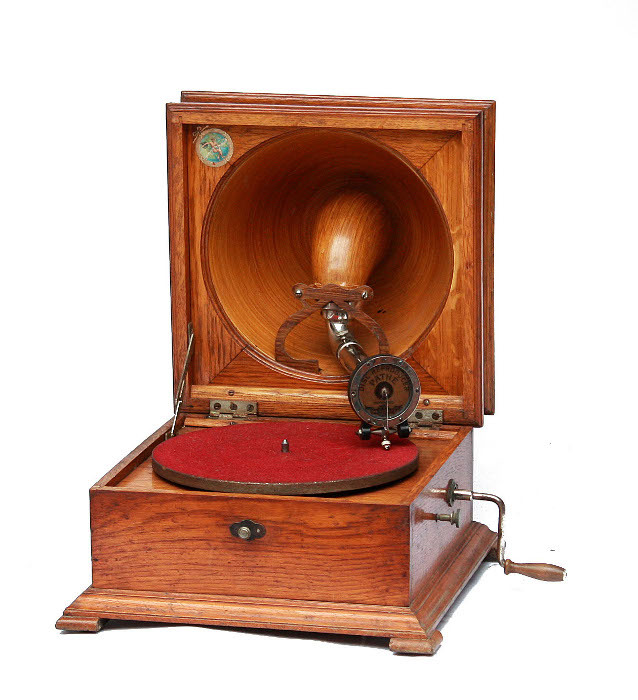 Pathé Coquet phonograph. 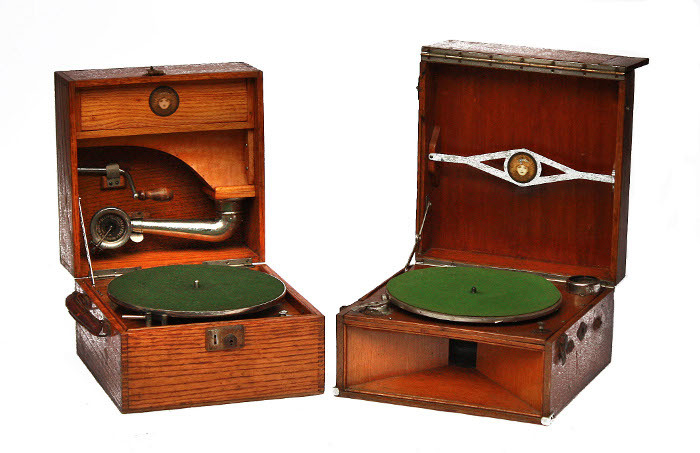 Standard and Salon mandrels, floating reproducer, Orpheus attachment, walnut case with shaped bentwood lid. 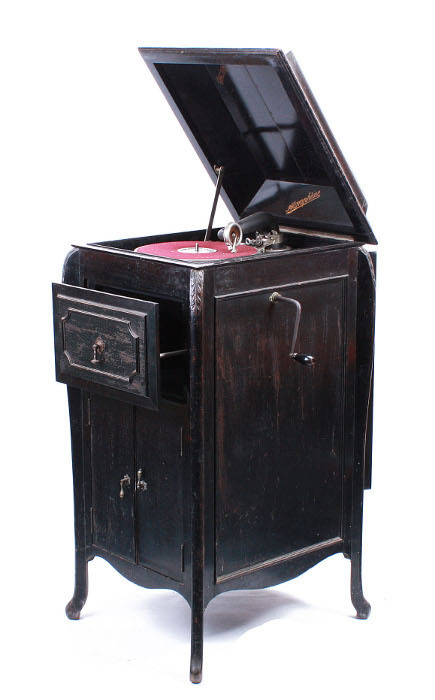 Pathé Coq phonograph. Enclosed spring motor, floating reproducer, walnut base with lid. 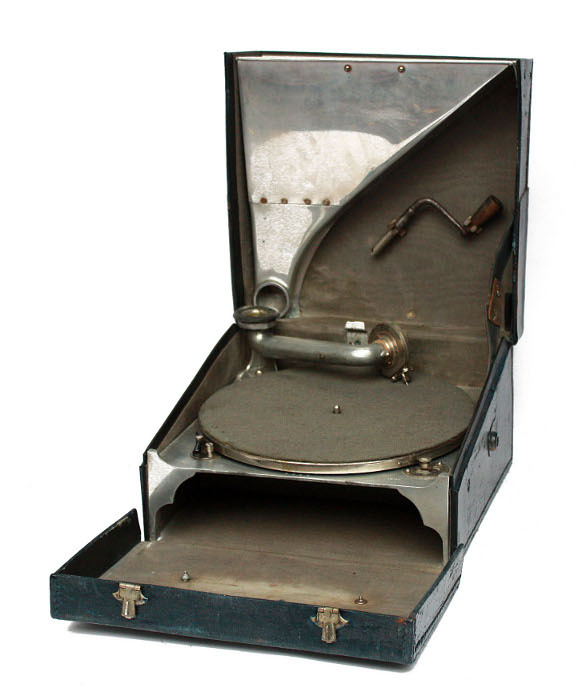 Pathé Coq phonograph. 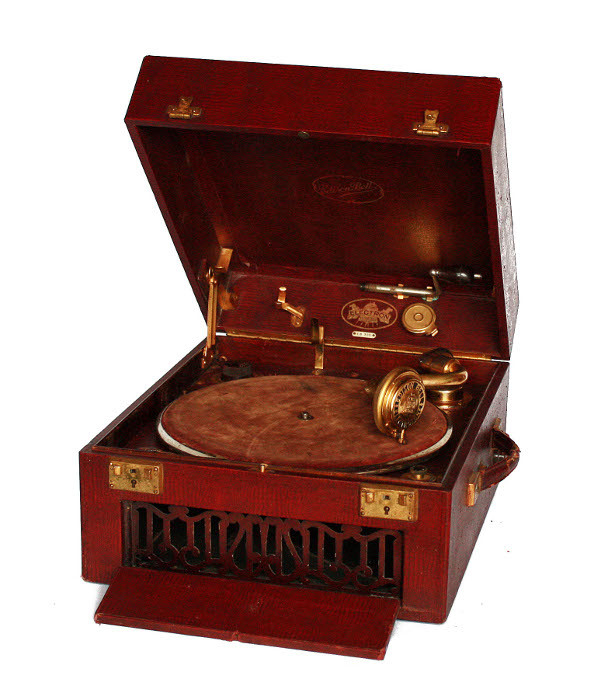 Double spring motor, crank wound, integral Orpheus attachment, floating reproducer, wood base with bentwood cover. 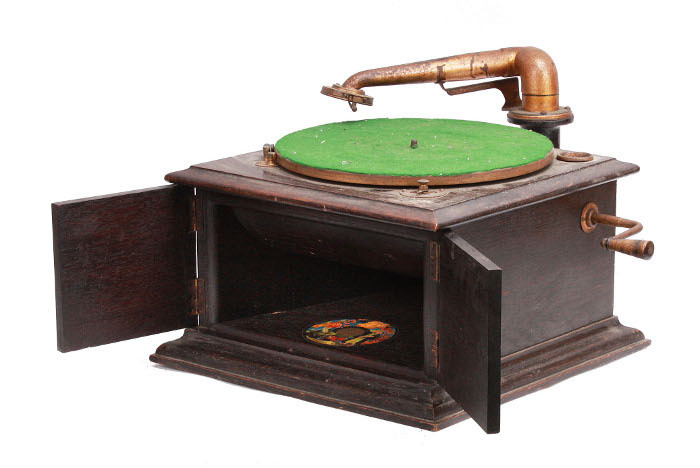 Puck phonograph. Black & Gilt lyre shaped base with brass flower horn. Floating reproducer. Bestone portable. 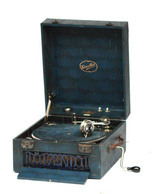 Blue case, Bestone Celebrity soundbox, Garrard motor, aluminium chassis and horn in lid. Table grand of Pathé New Orpheus pattern. Pathé aluminium reproducer on tapered tone-arm. Resona portable. Brown crocodile grained case, Resona soundbox, aluminium motor board. 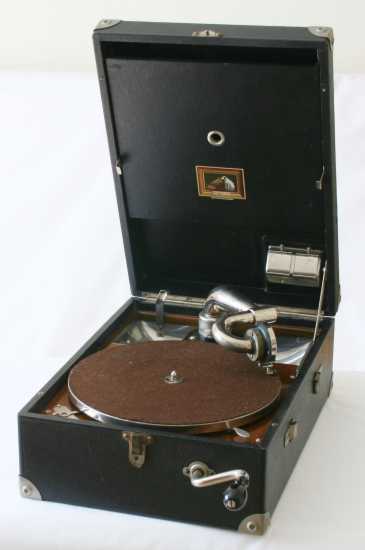 Thorens Cleopatra phonograph. 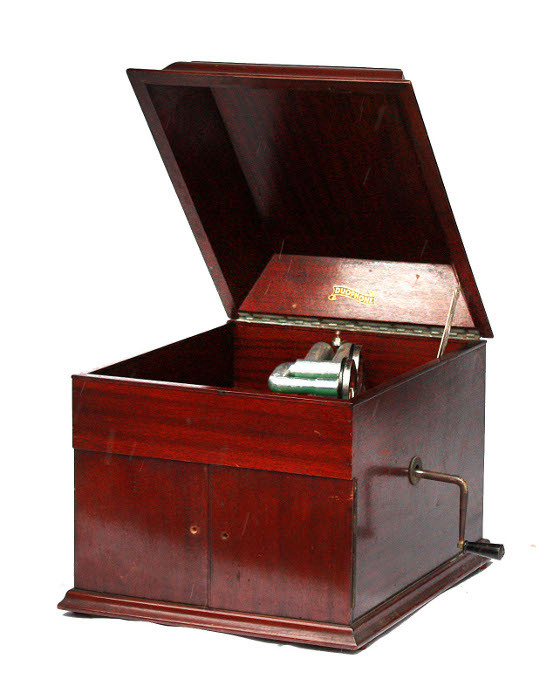 Double spring open motor, floating 'Cleopatra' reproducer, reversible walnut case.